أفياش ومفاتيح ملكية فاخرة / منتج ألماني ملكي . 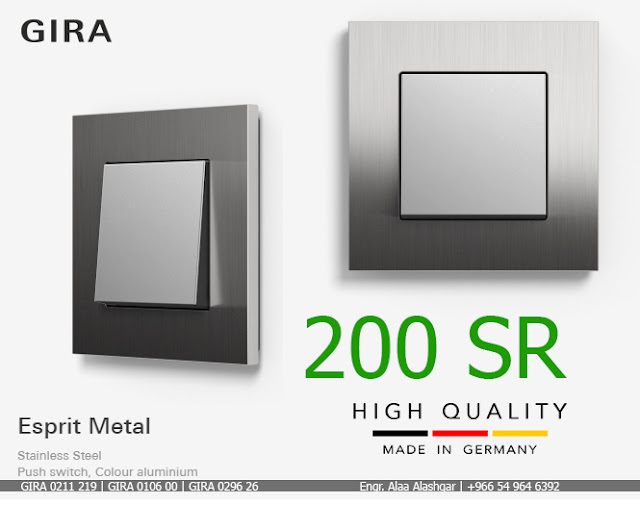 أرقى أجود أنواع الافياش في العالم , الان في المملكة العربية السعودية- الرياض , مع امكانية التوريد لجميع مناطق المملكة . Our logo in the course of time-110 years gira. 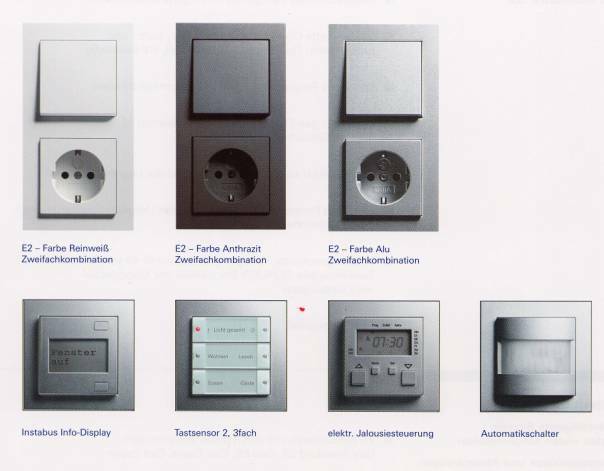 Not just us and our products have changed over the years, but also our appearance and our company logo. 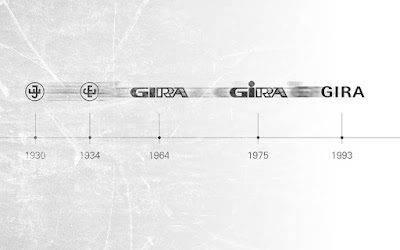 Look at the development! 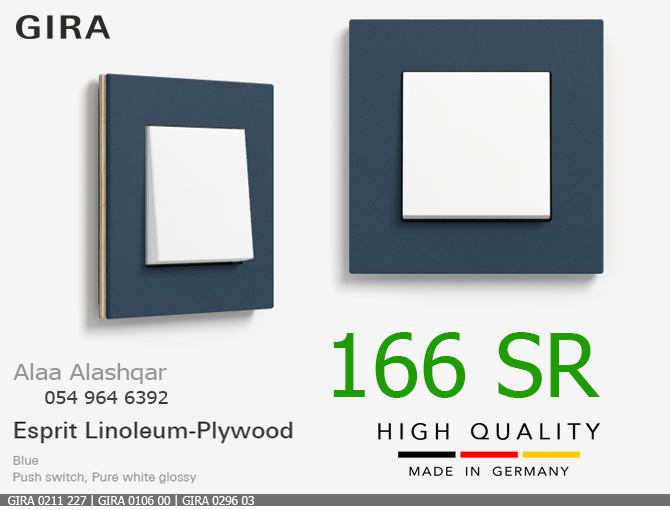 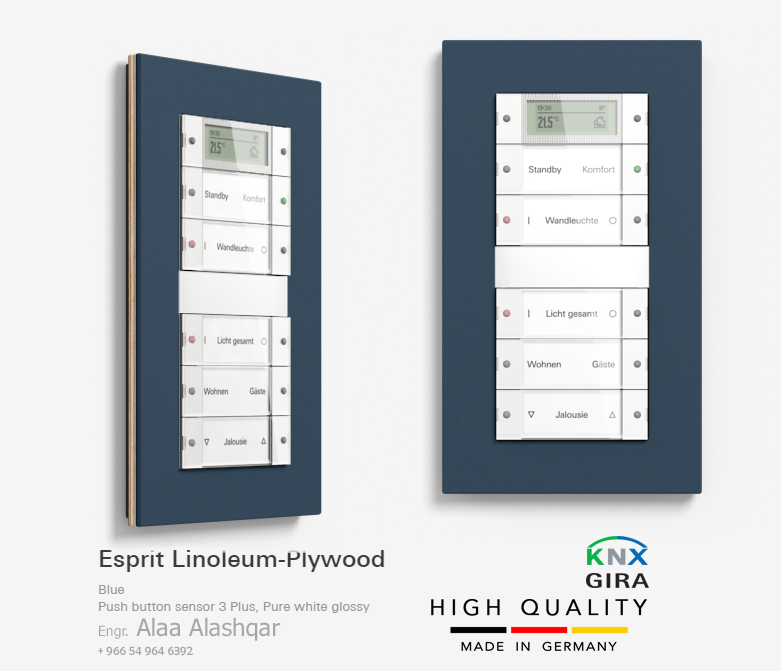 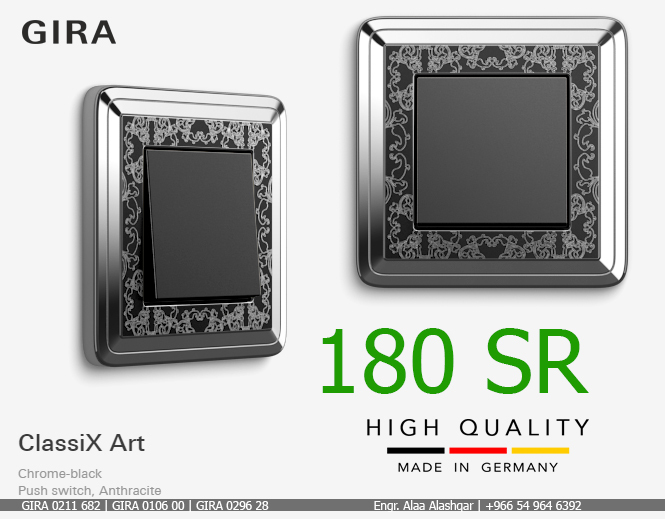 May we introduce: the excellent switch range Esprit Linoleum-Multiplex, as well as the excellent gira presence detectors mini standard and comfort. 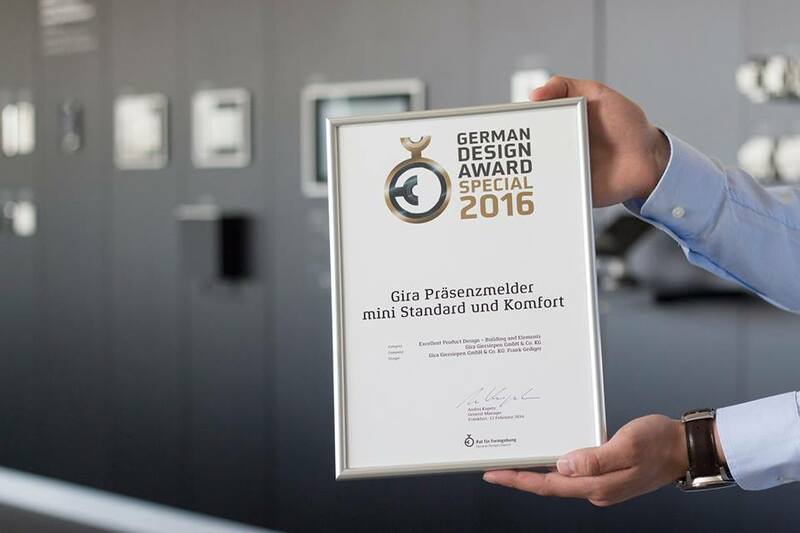 Also this year we look forward to the awards at the German Design Award, awarded by the council for design, in the category of "excellent product design - building and elements". 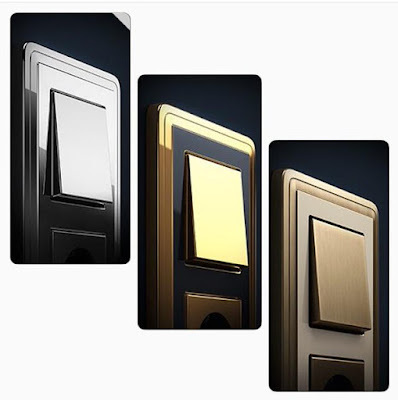 The high quality of the material used for the range makes the devices resistant against wear. It consists of shatter-proof and shock-resistant thermoplastic with a high resistance to ultraviolet light as well as a care-free surface. 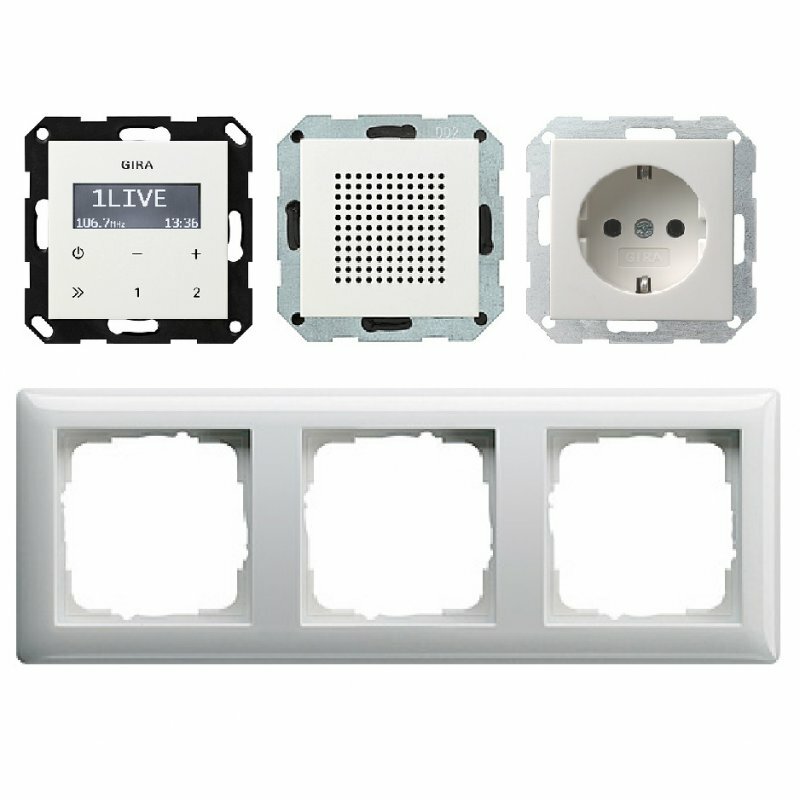 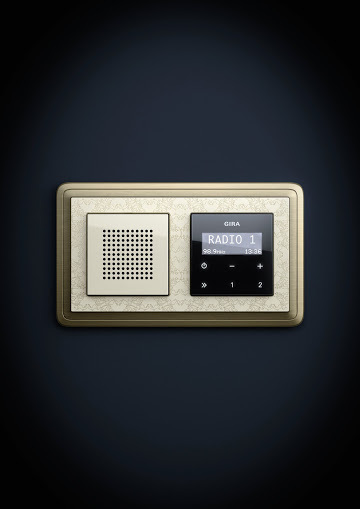 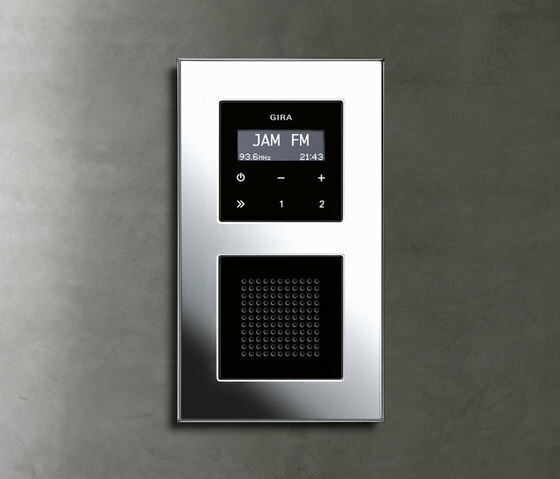 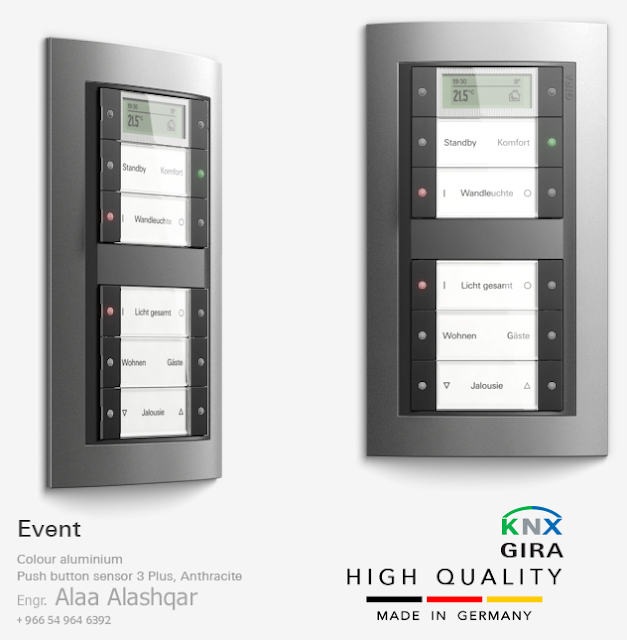 Gira Event is available in the full range depth of System 55 with more than 300 components for modern building management, whether for data and communication technology or bus technology. 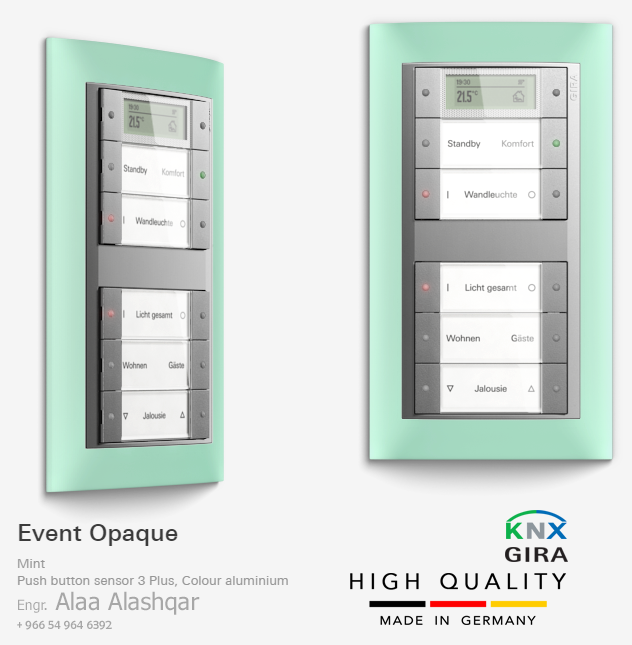 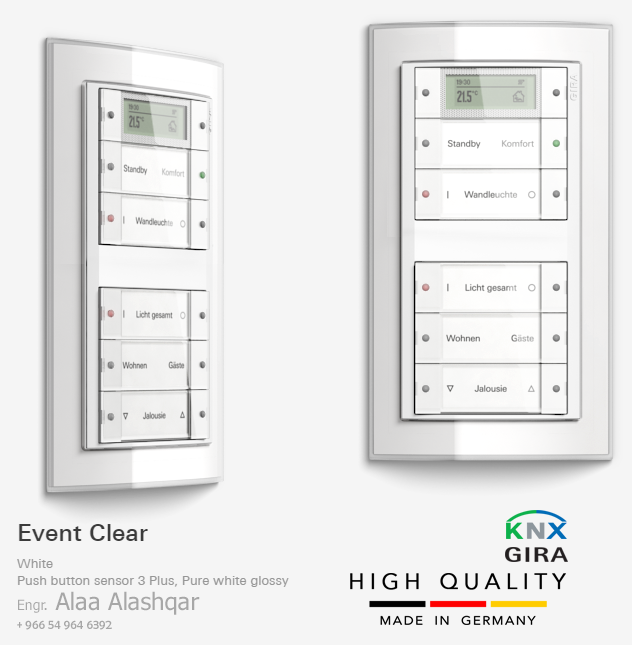 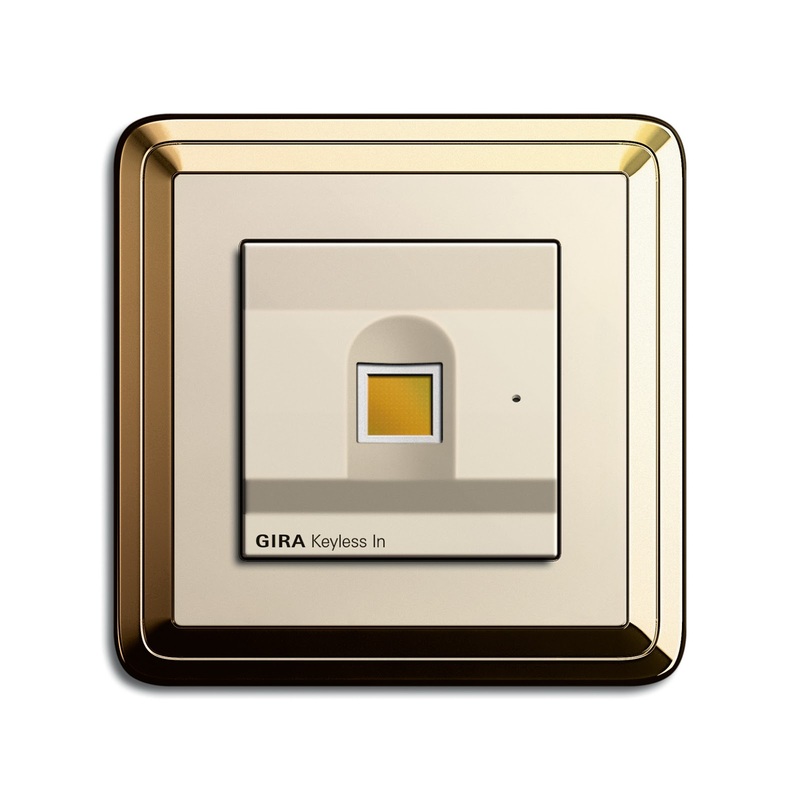 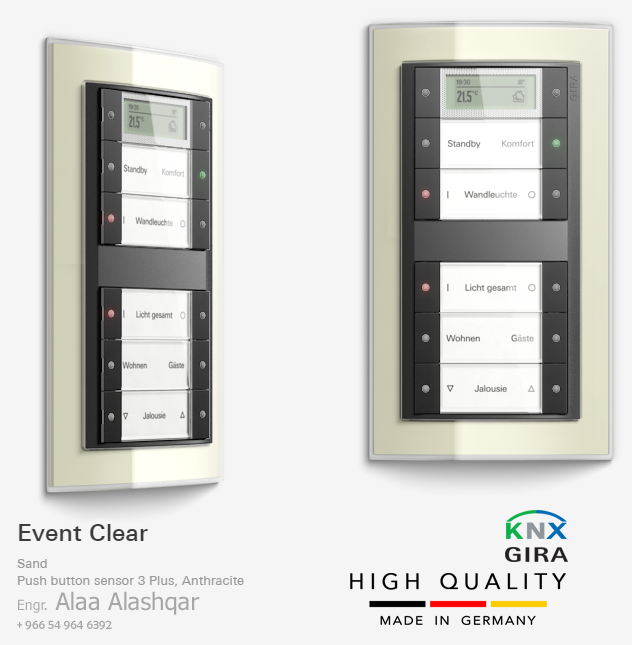 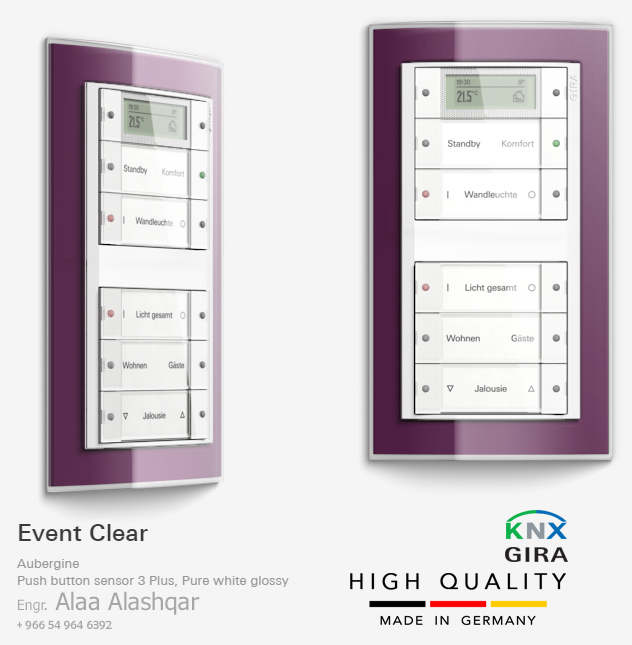 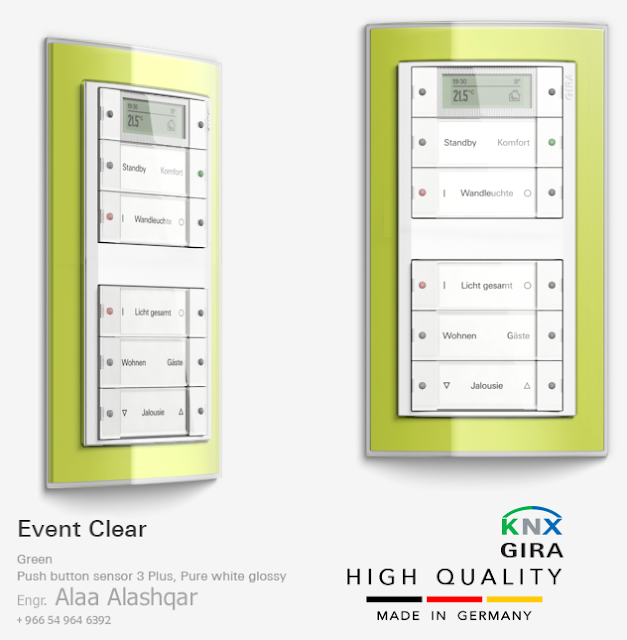 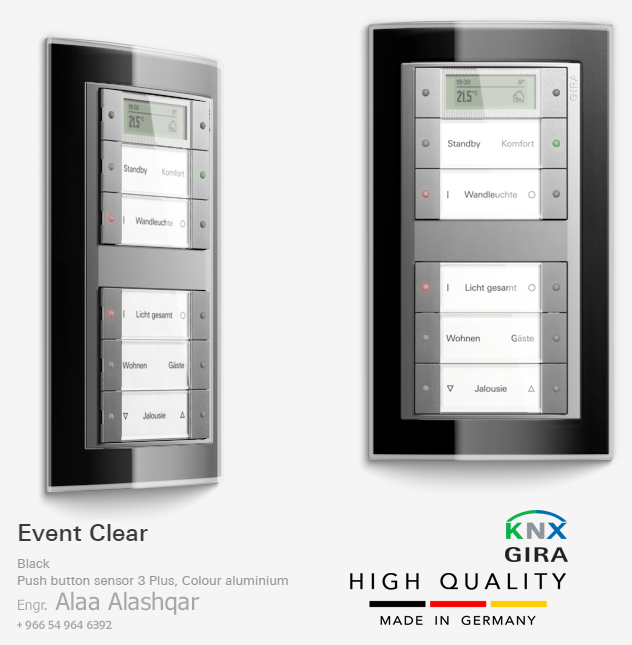 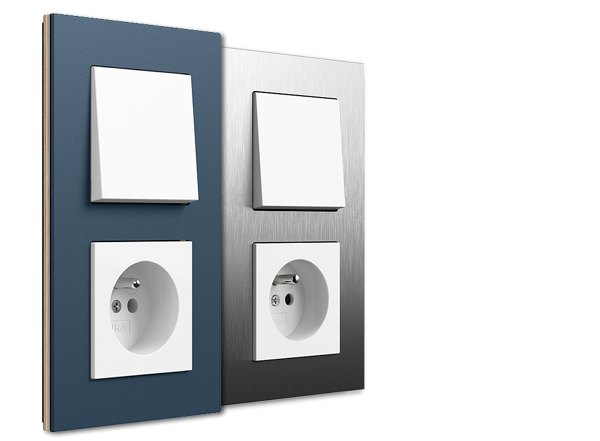 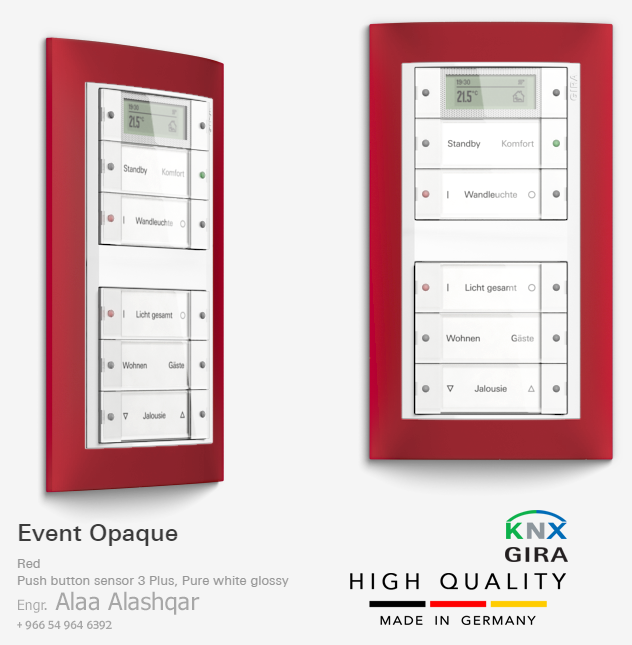 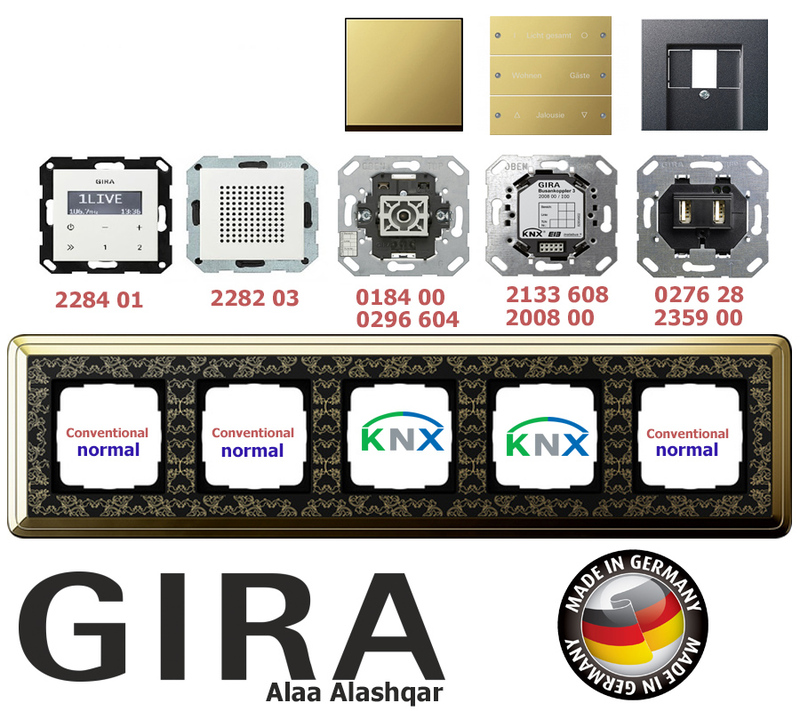 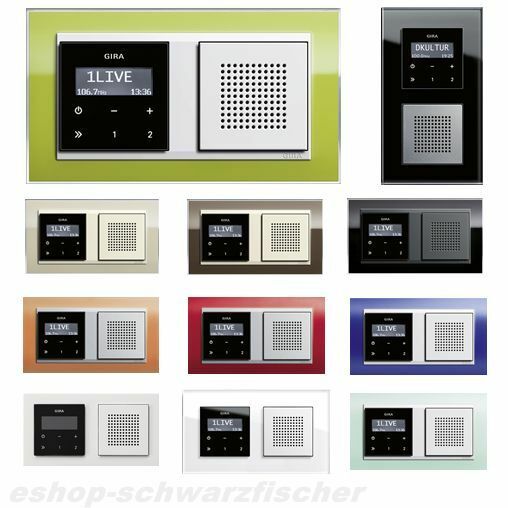 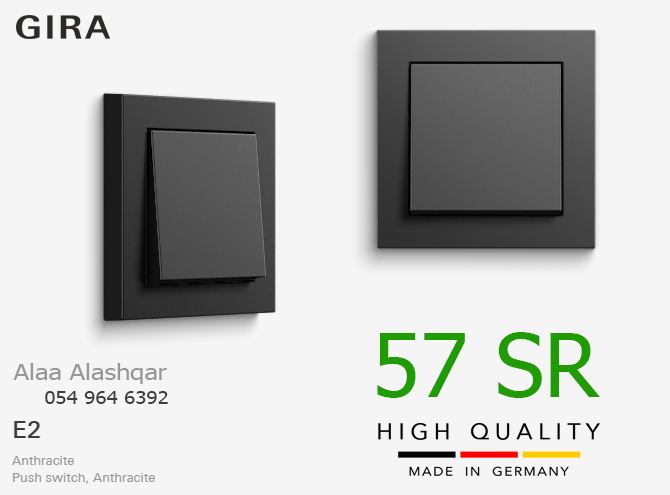 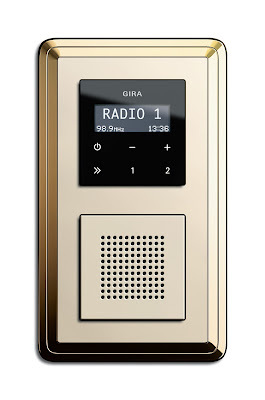 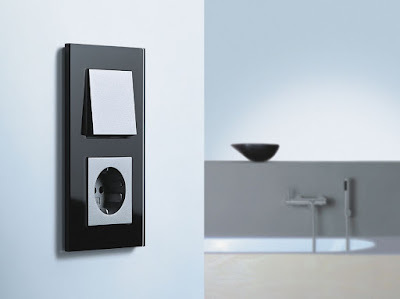 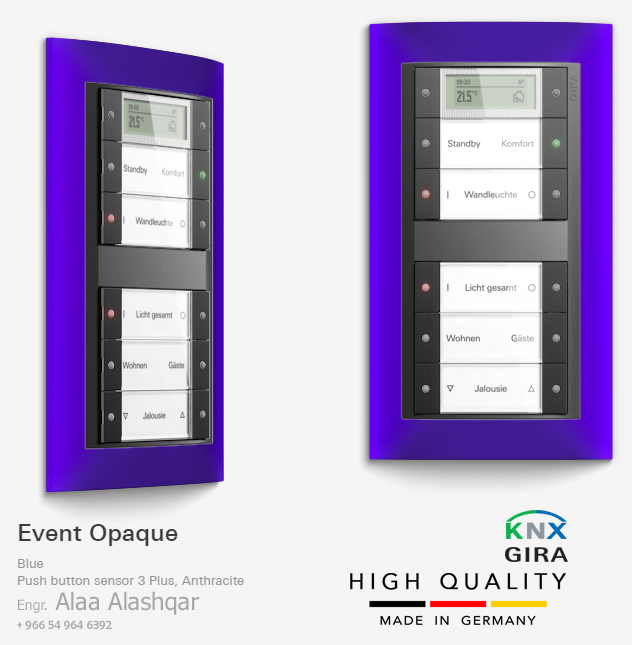 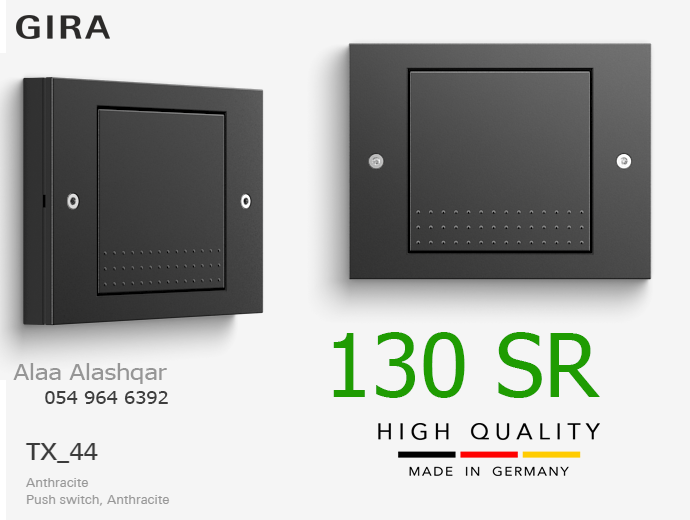 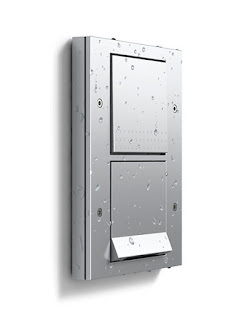 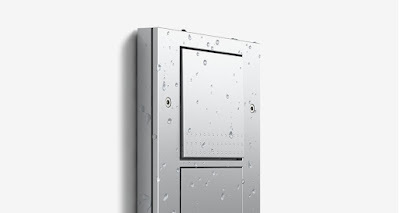 Gira Event is a switch range for flush-mounted installation in dry rooms in accordance with IP 20. 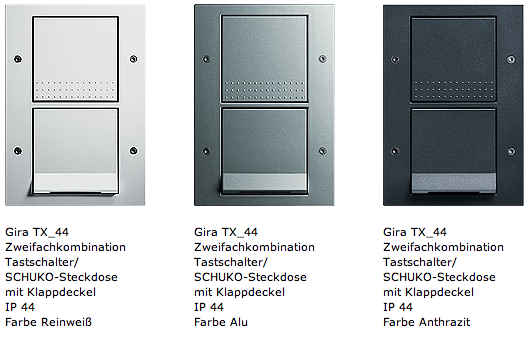 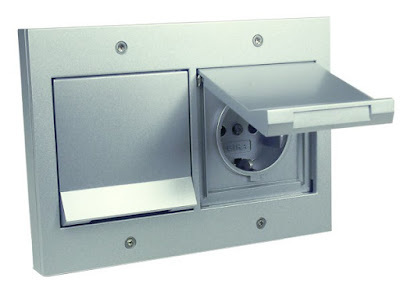 However, the switches, push buttons and SCHUKO socket outlets with hinged covers range functions can also be installed water-protected in accordance with IP 44 by using special sealing sets. Gira Event Clear creates colours with its very own luminosity. The particular effect of this design line is its clear, deep appearance with a high-gloss surface resulting from the colour highlighting of transparent plastic. Thus the incidence of light upon the colour is modified to develop a unique intensity. 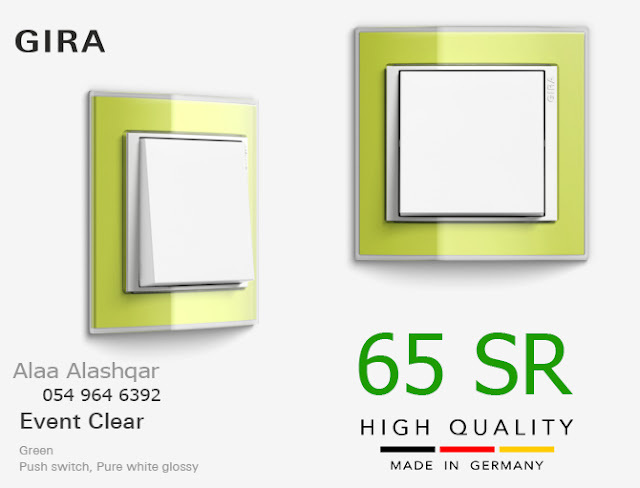 Gira Event Clear is available in green, white, black, brown, sand and aubergine. 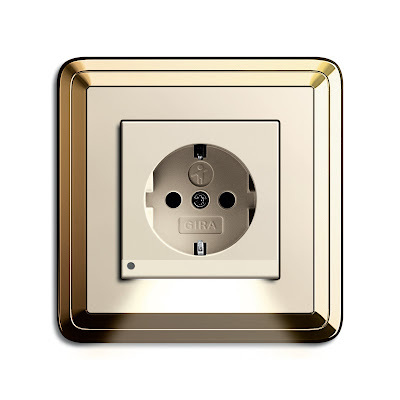 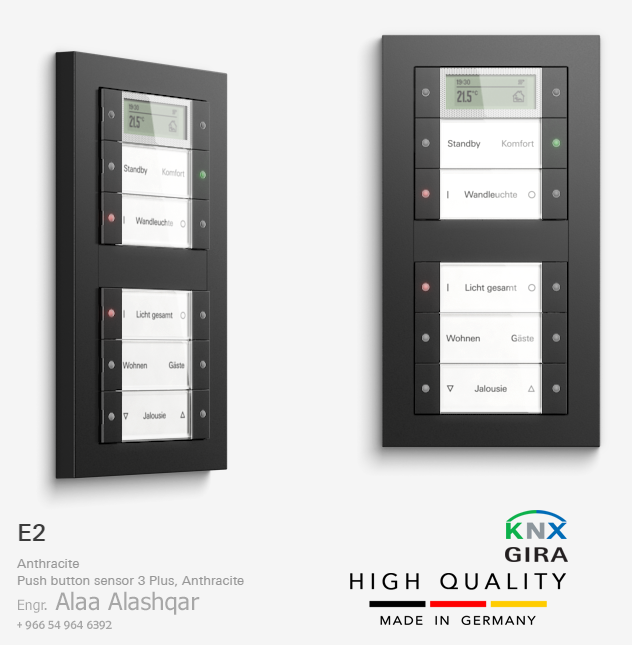 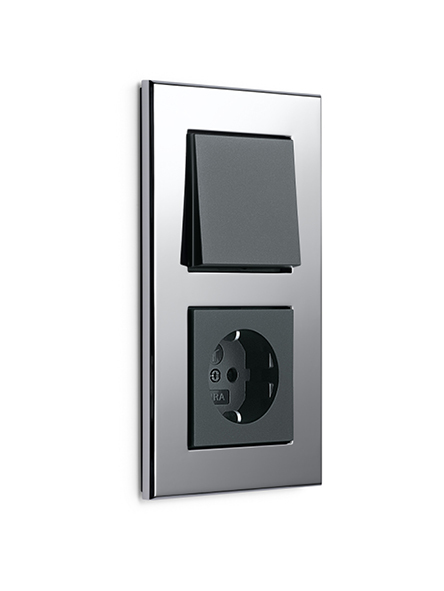 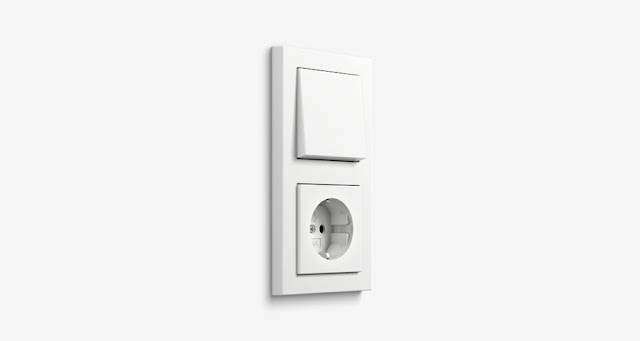 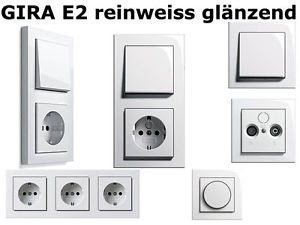 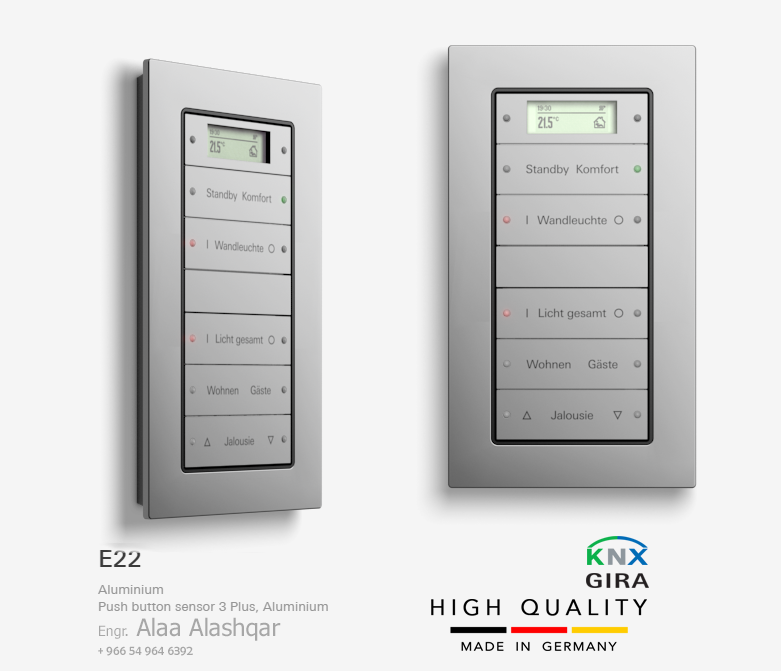 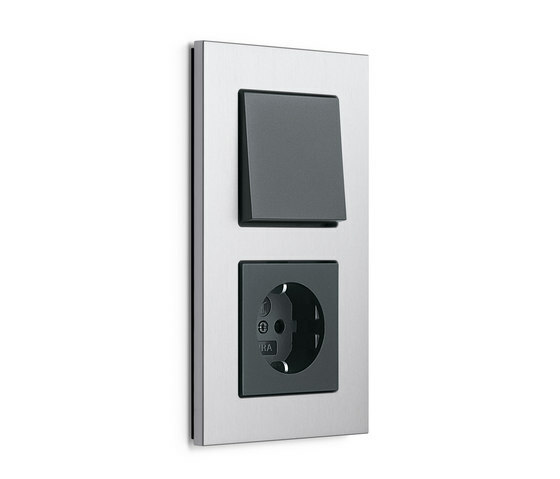 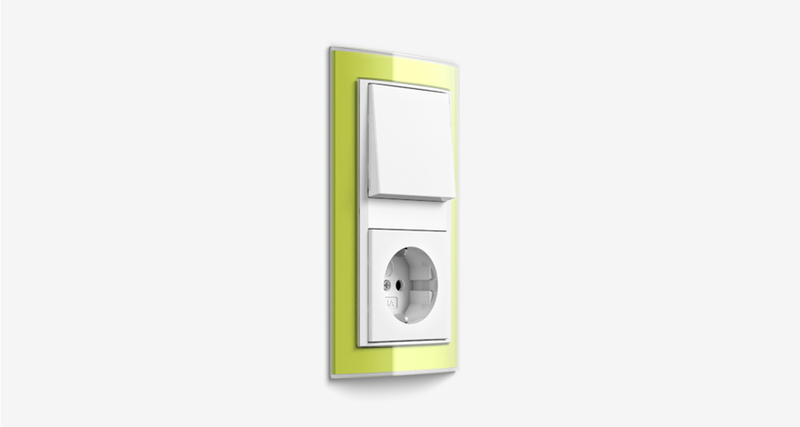 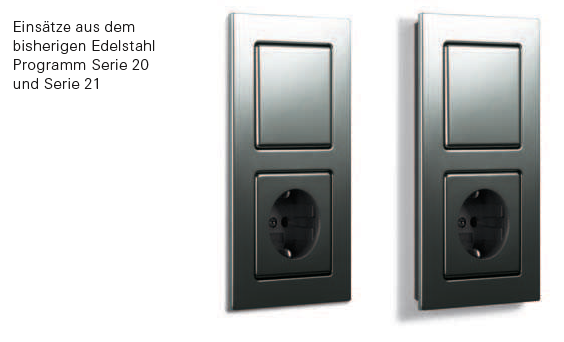 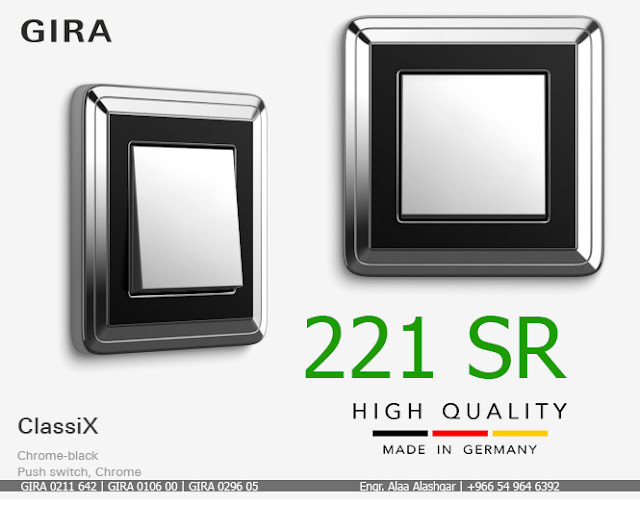 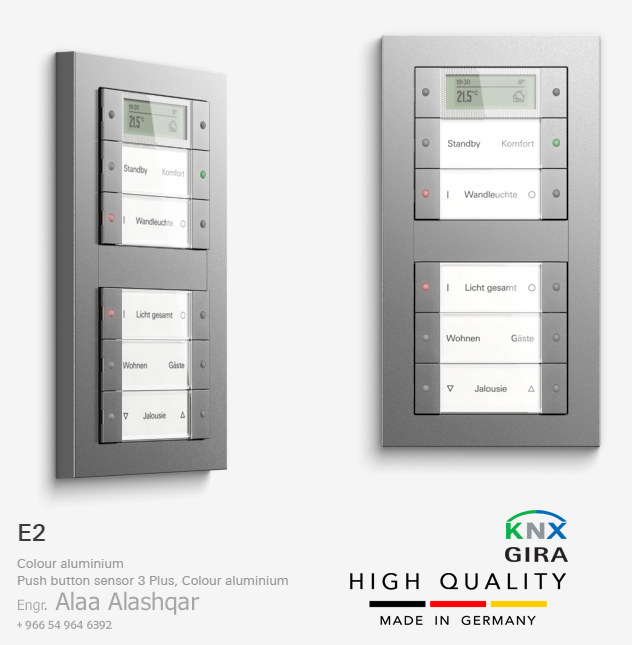 Gira E2 is a switch range for flush-mounted installation in dry rooms in accordance with IP 20. However, the switches, push buttons and SCHUKO socket outlets with hinged covers range functions can also be installed in humid rooms water-protected in accordance with IP 44 by using special sealing sets. 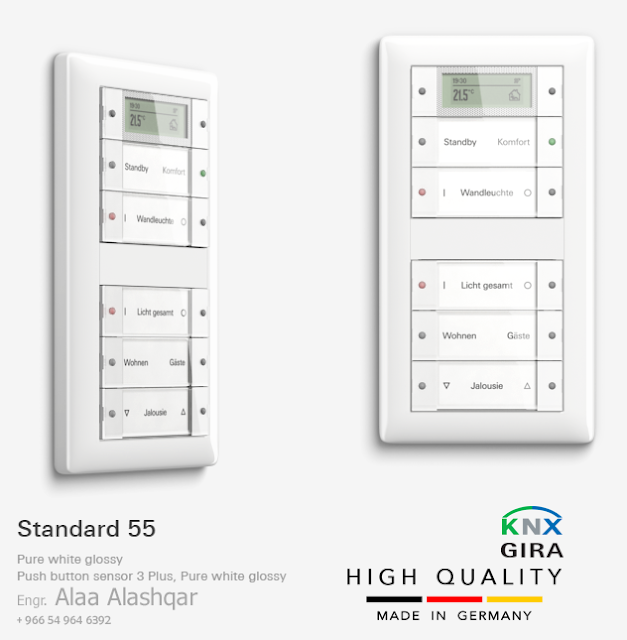 The new Gira E3 switch range combines rounded design contours with satin­finish and glossy surfaces in nine subtle shades. A wide variety of designs can be created by combining support frames and inserts in anthracite or pure white glossy with the colourful cover frames. 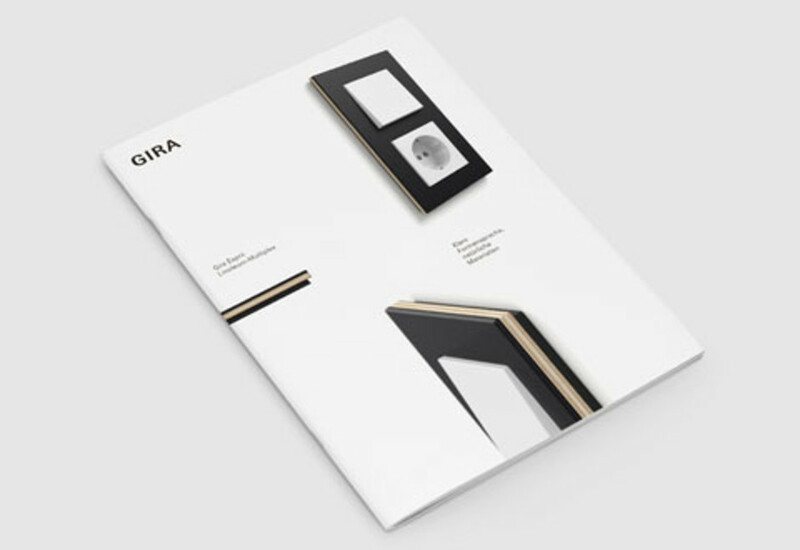 The entire world of intelligent building technology opens up with matching inserts from Gira System 55. Gira E3 is the ideal choice for harmoniously coordinated interior design concepts. 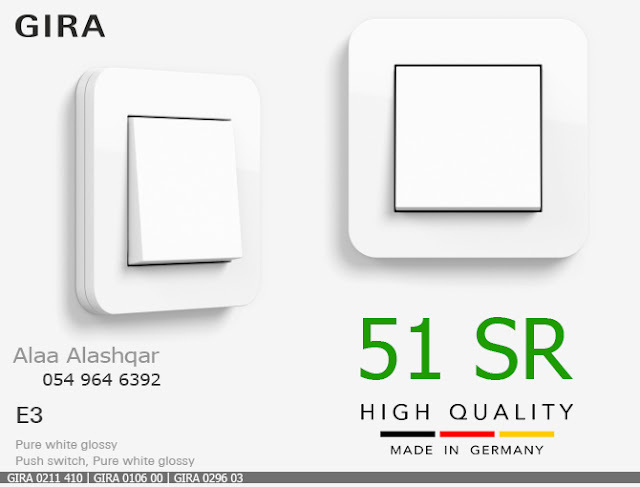 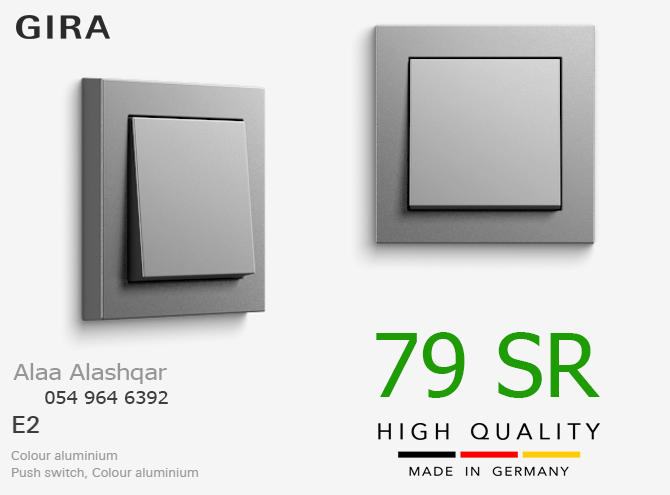 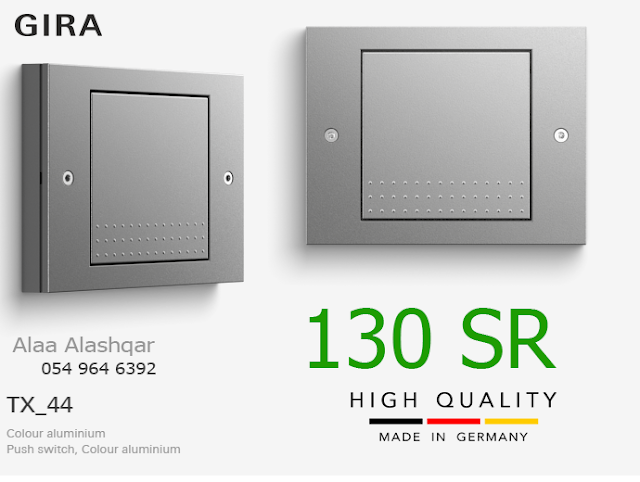 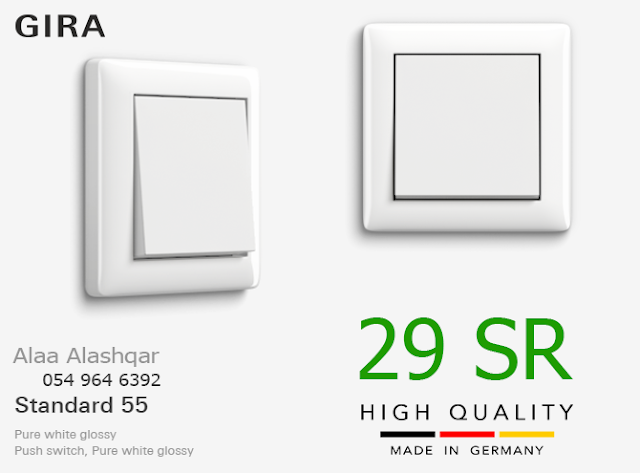 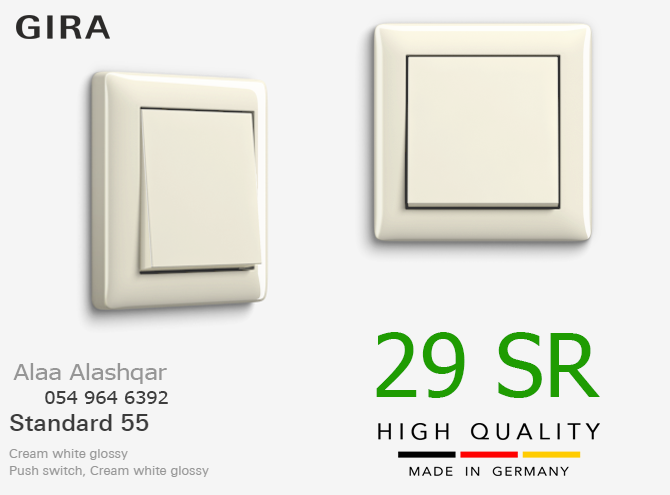 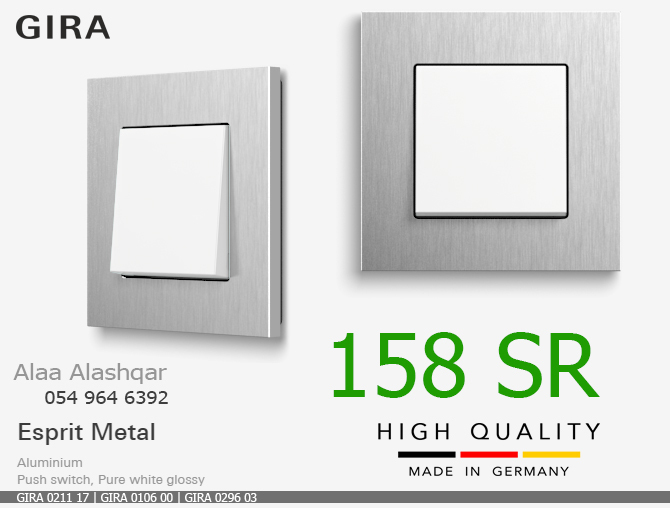 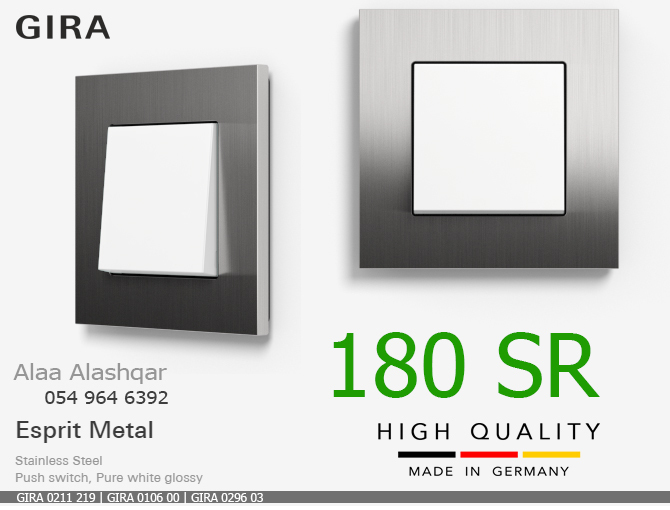 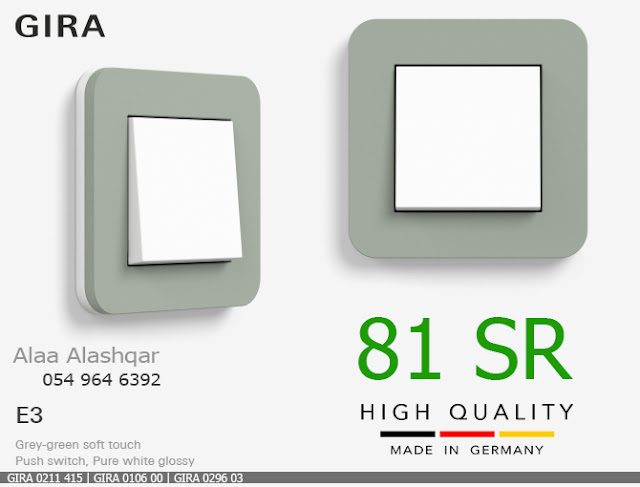 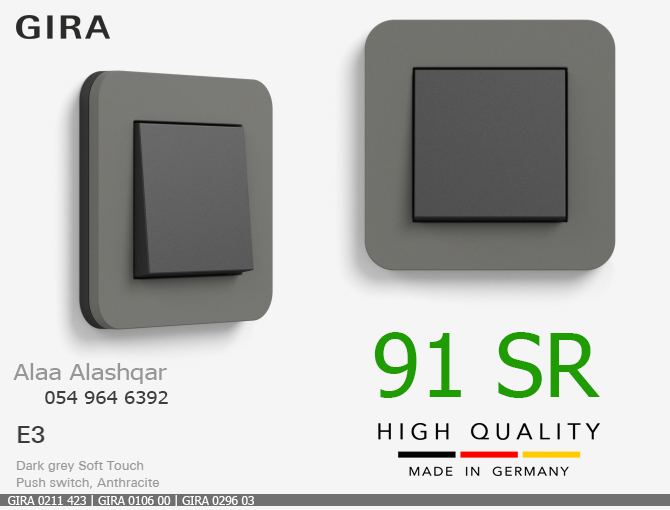 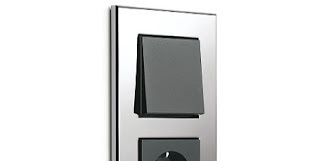 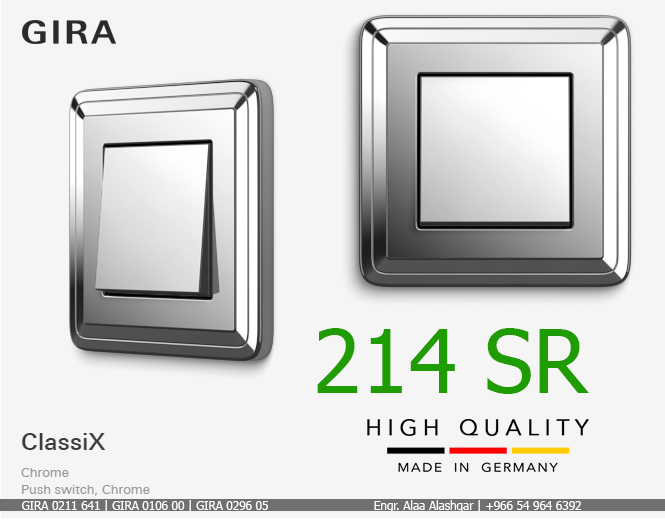 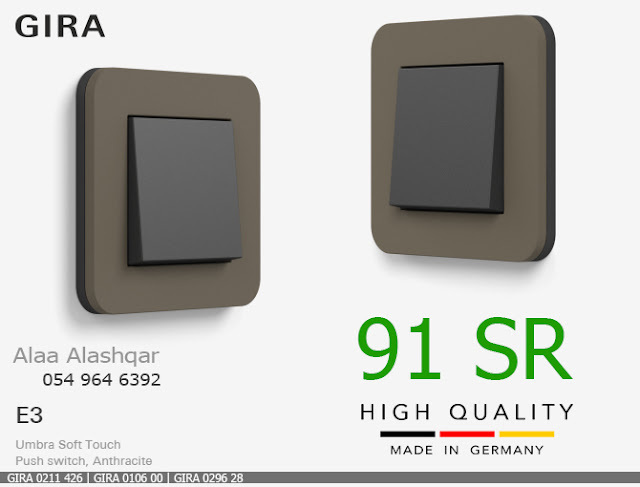 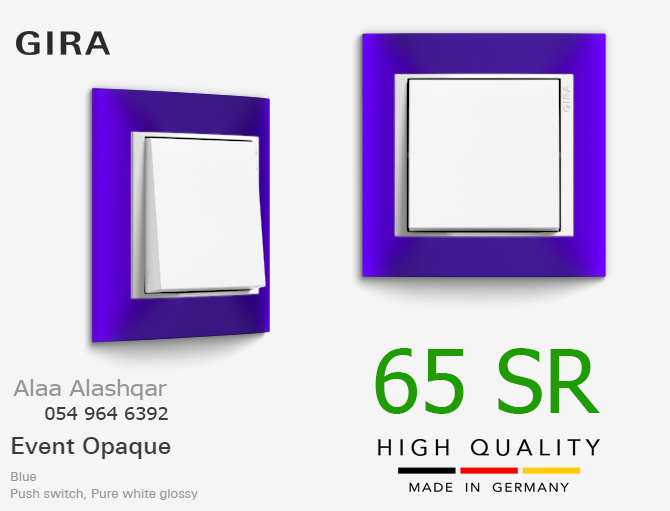 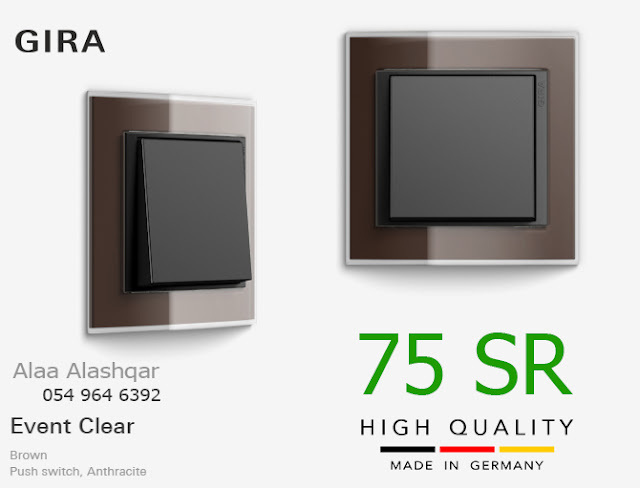 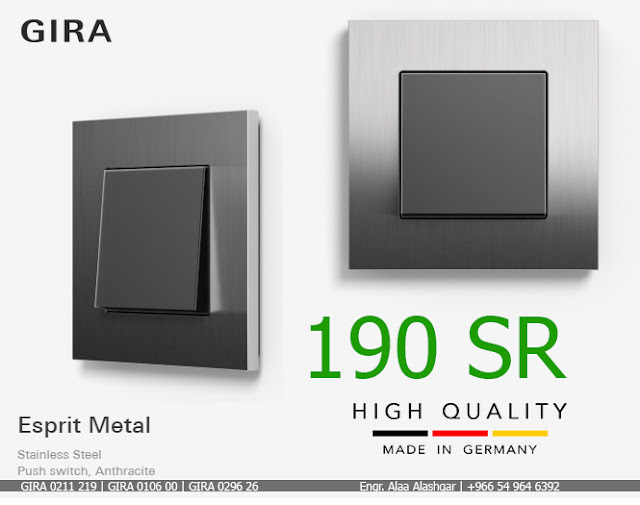 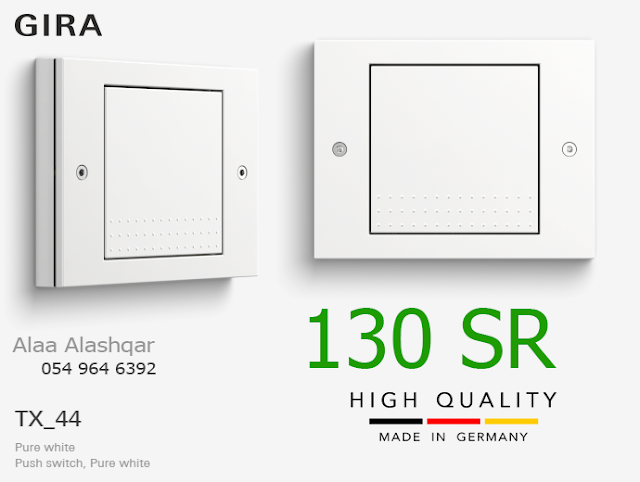 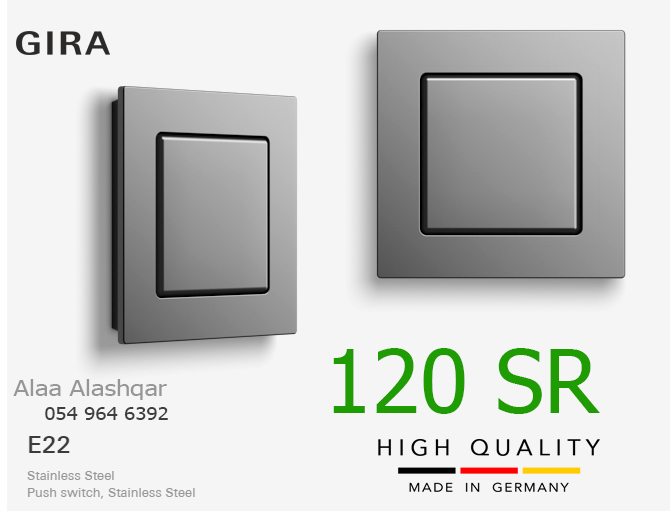 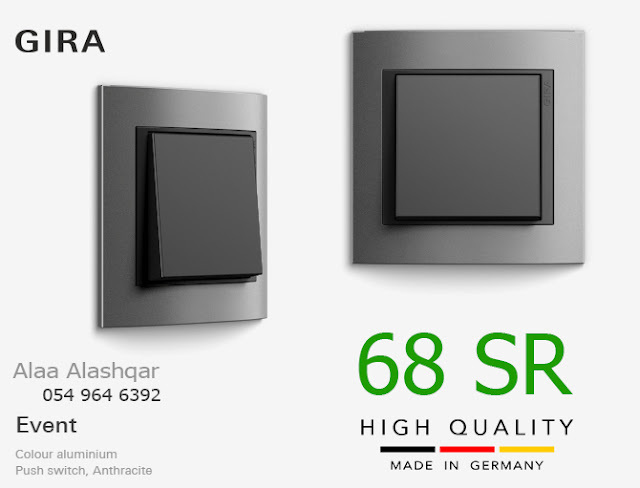 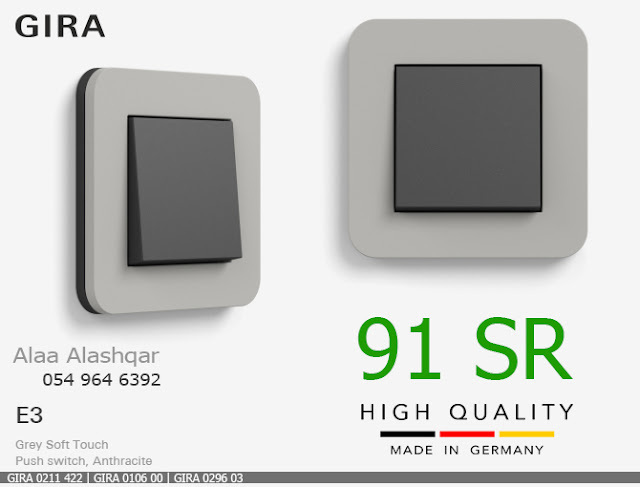 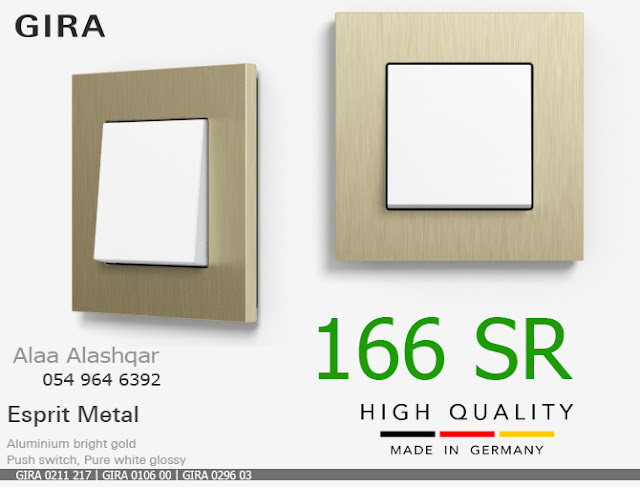 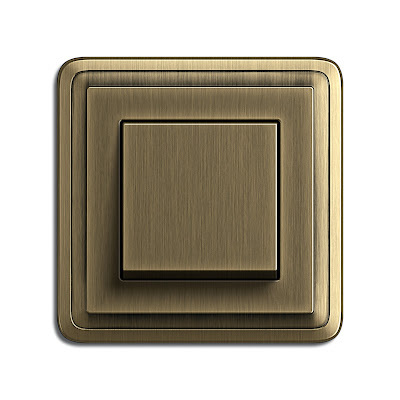 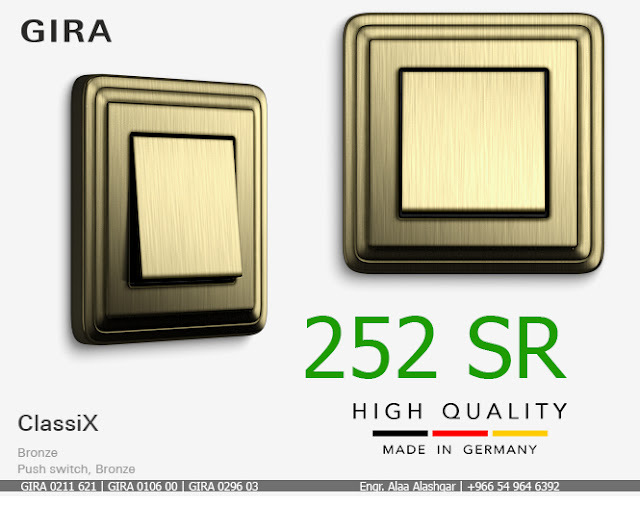 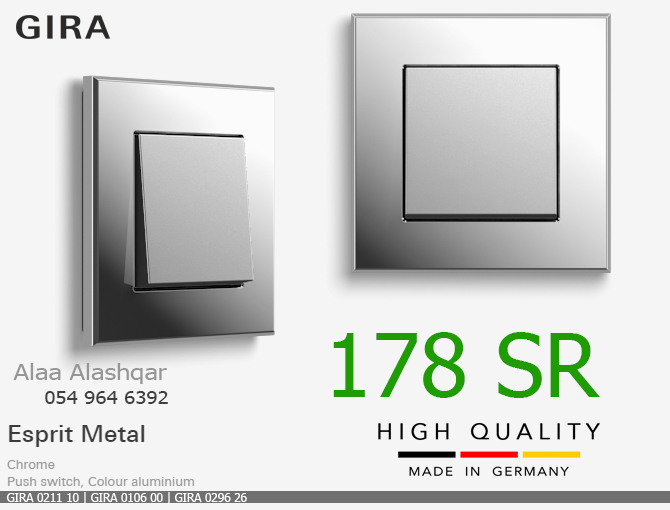 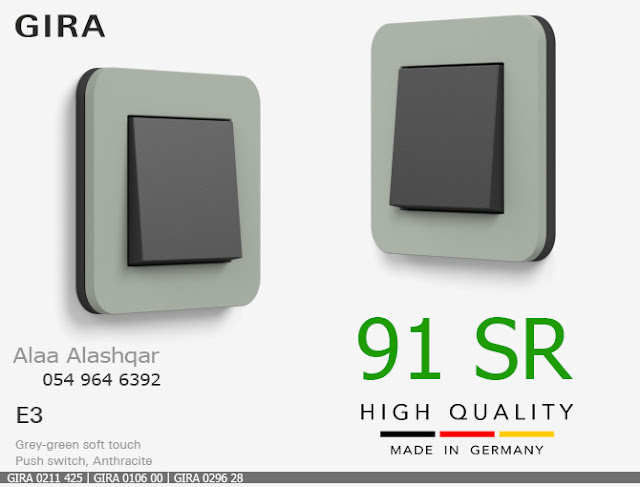 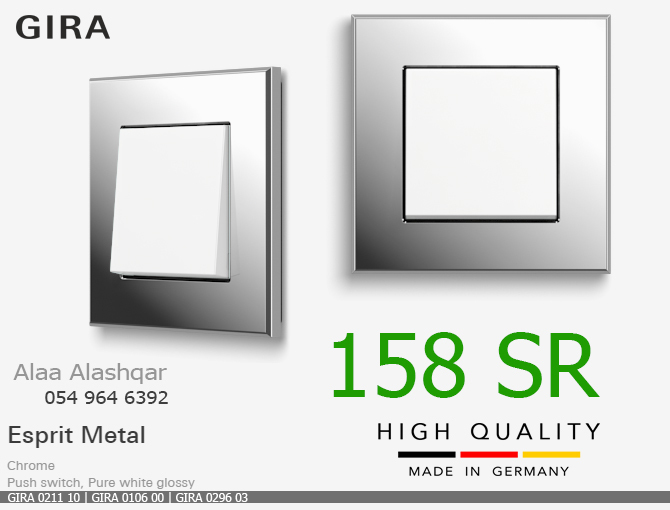 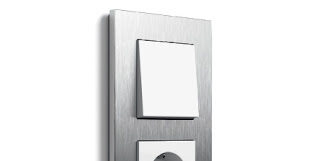 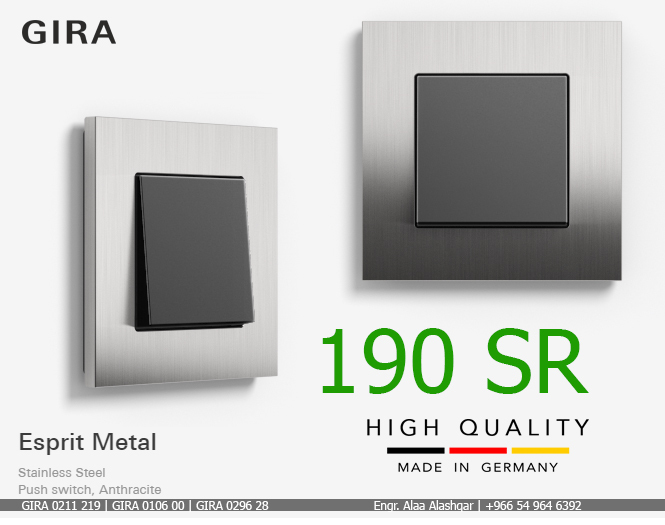 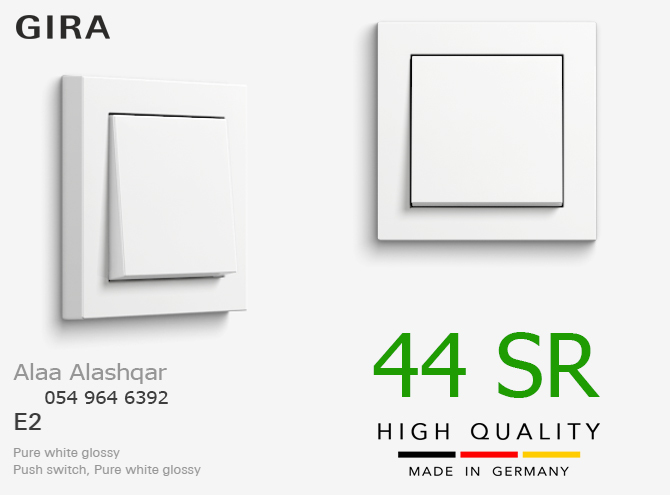 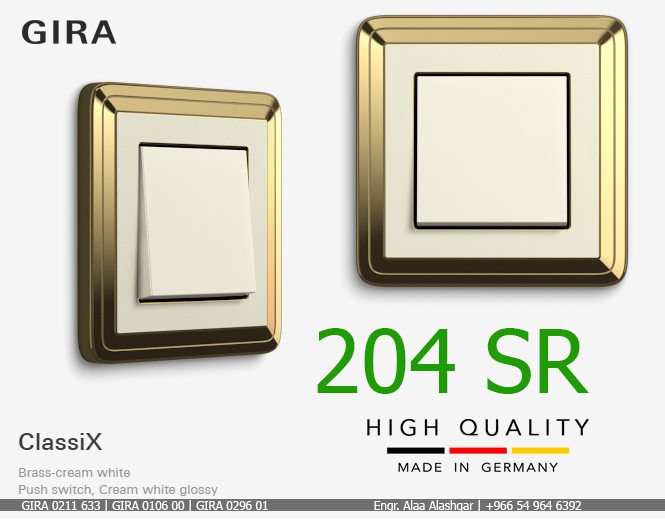 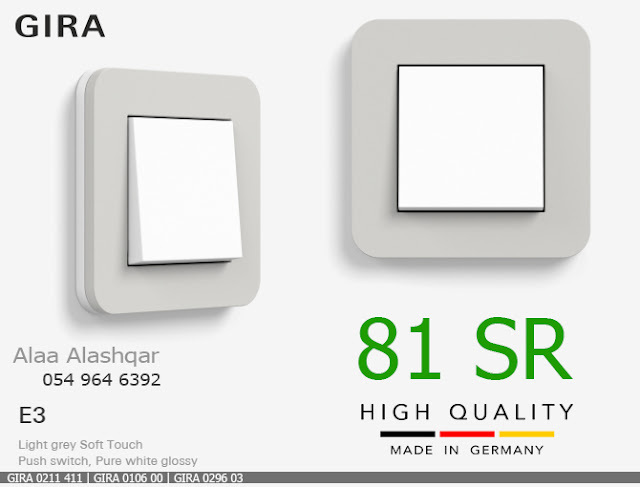 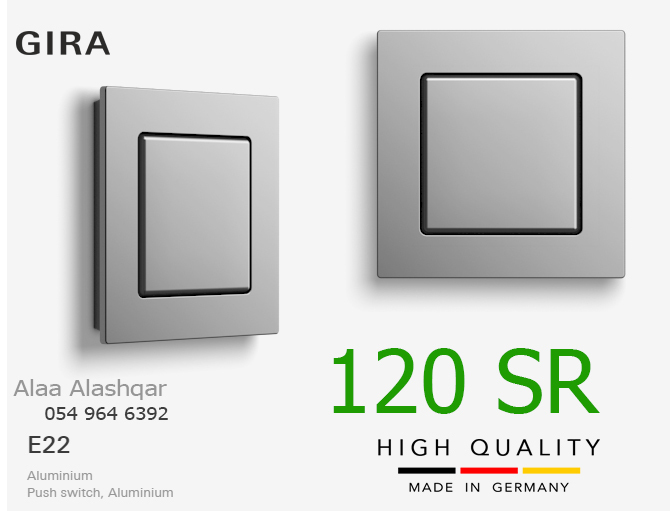 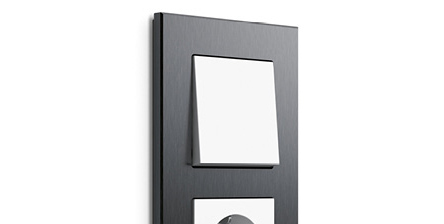 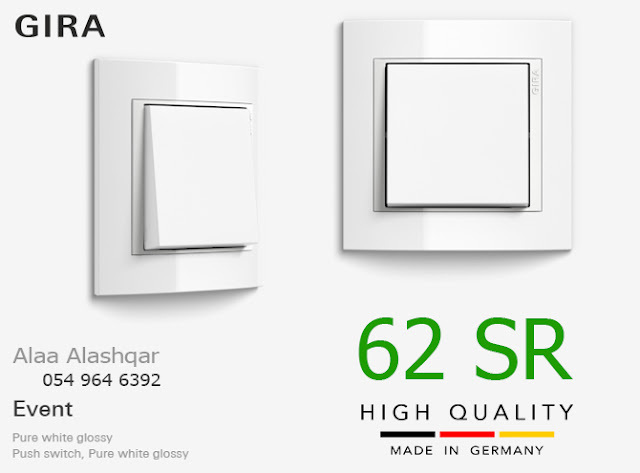 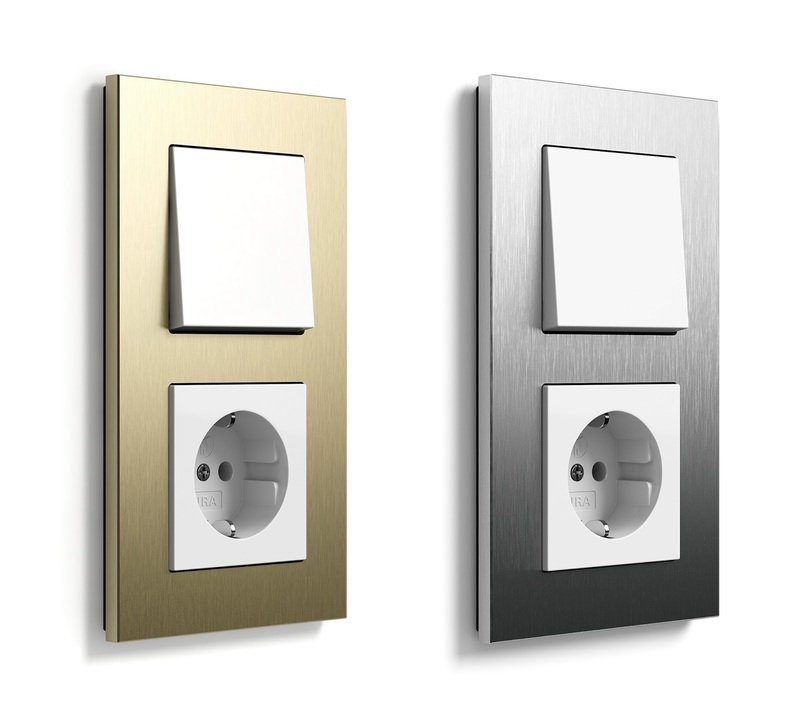 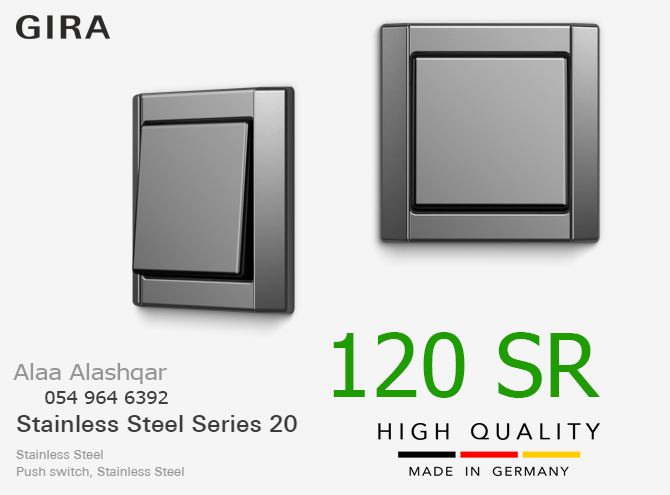 Gira Stainless Steel is an elegant switch range with two series: Series 20 and Series 21. 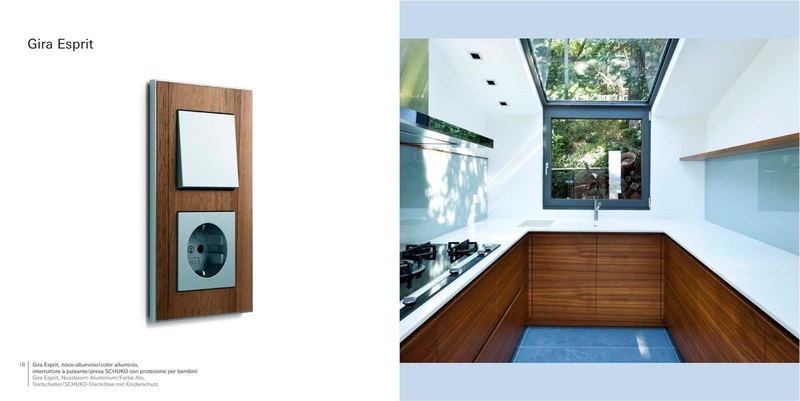 Both are made of stainless steel and feature a sand-blasted matt surface. 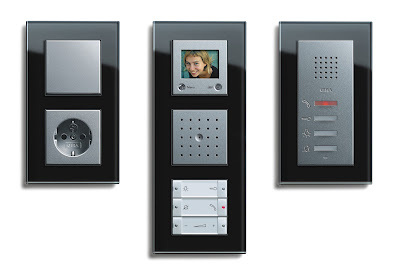 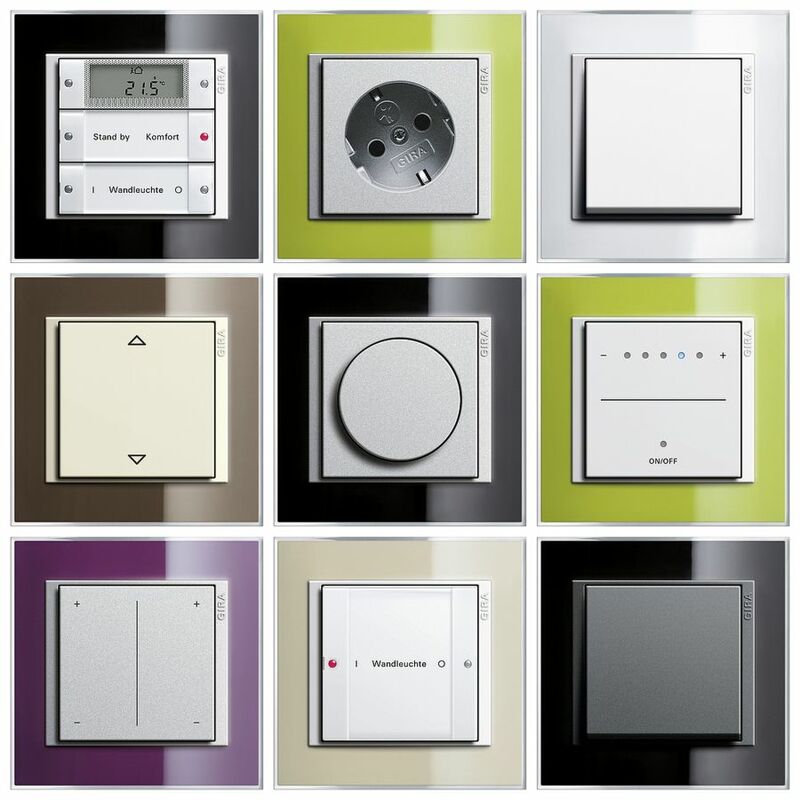 The product range encompasses all the functions which are essential for modern building management. 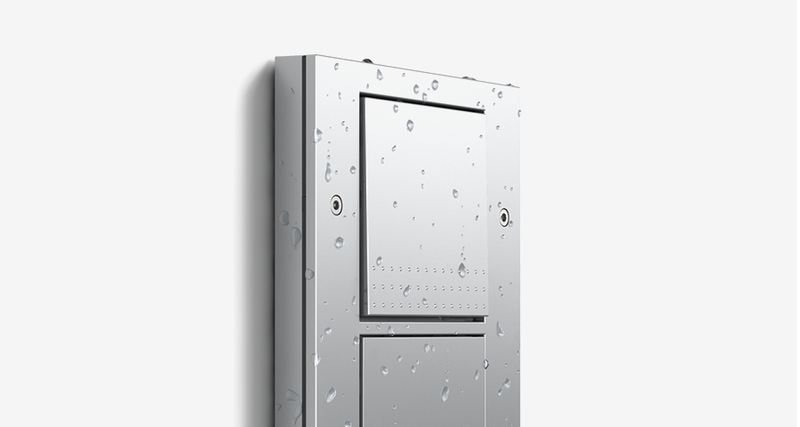 It is advantageous that switches, buttons and socket outlets with hinged covers from Series 21 can also be installed water-protected and flush-mounted IP 44 in combination with special sealing sets. 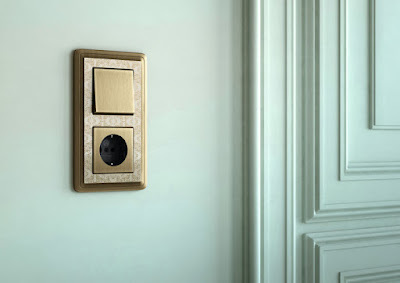 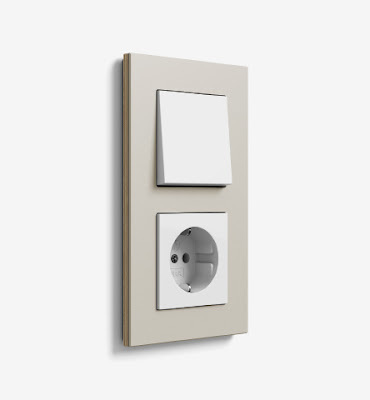 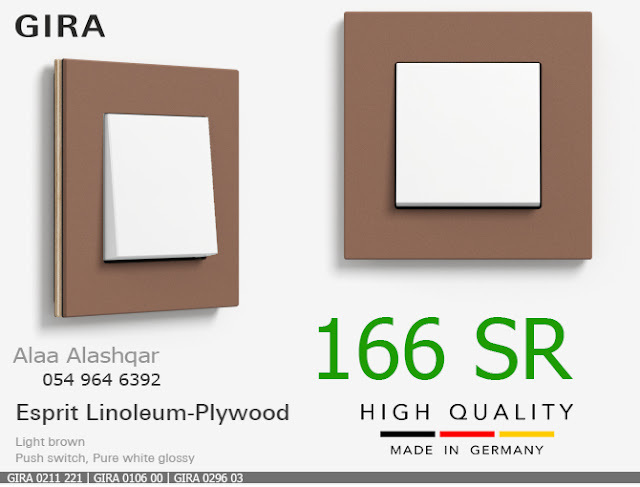 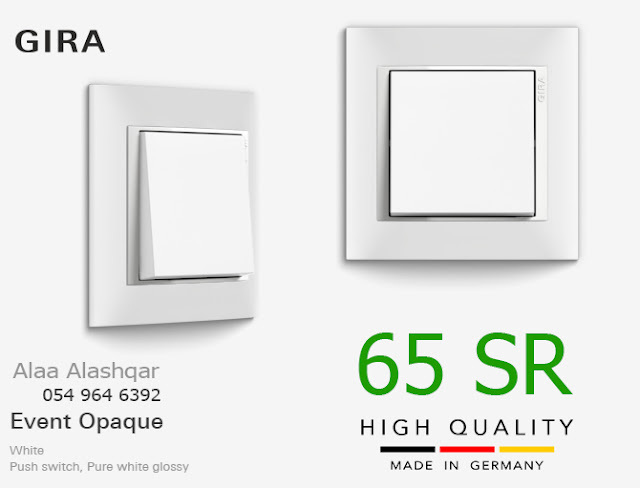 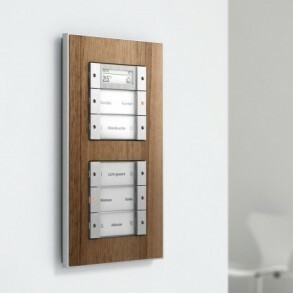 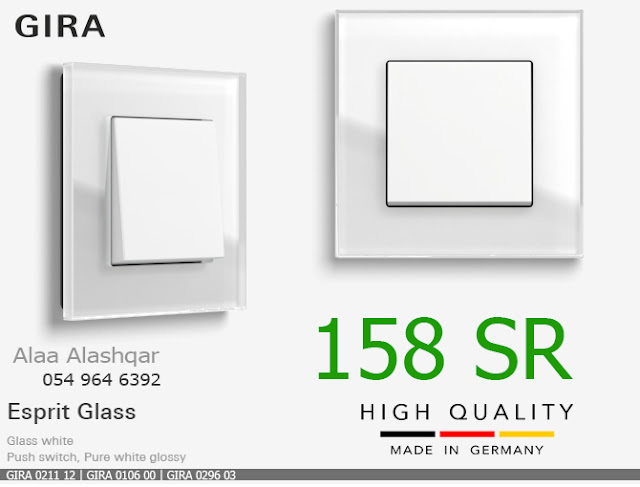 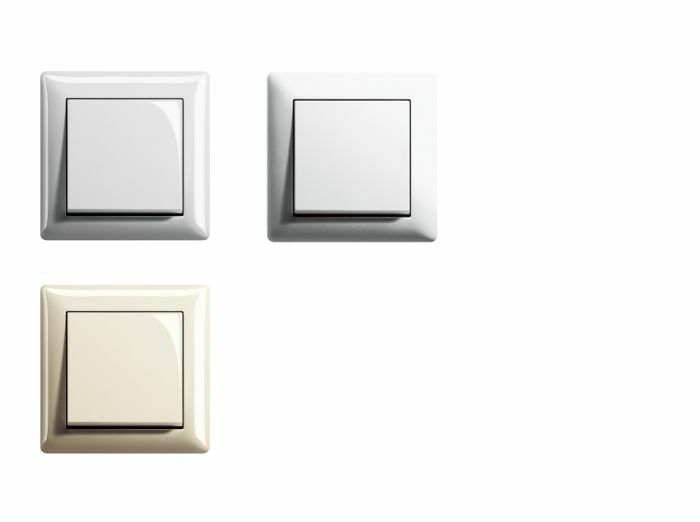 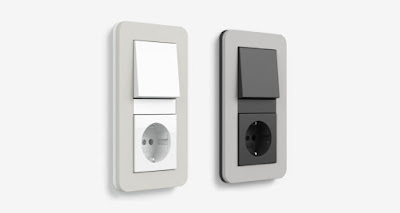 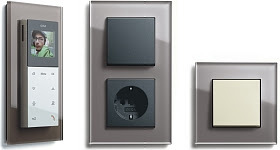 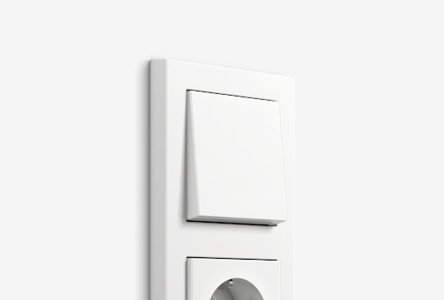 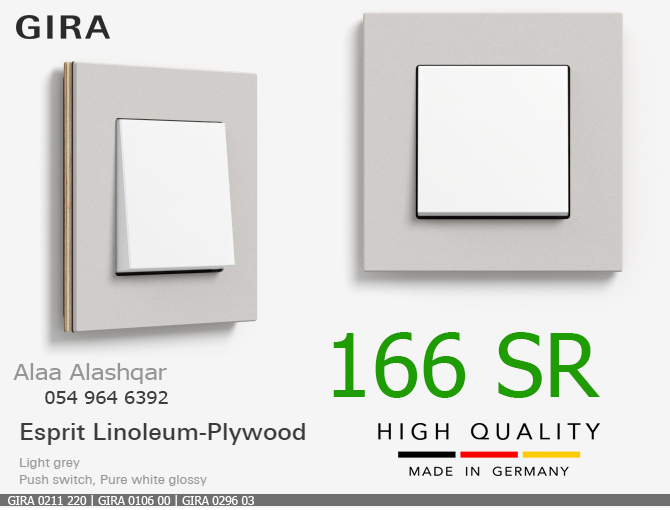 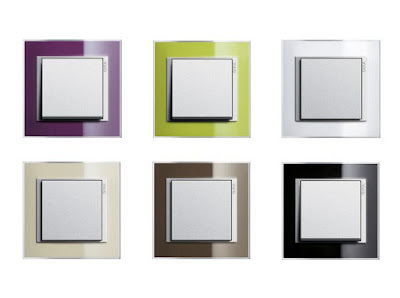 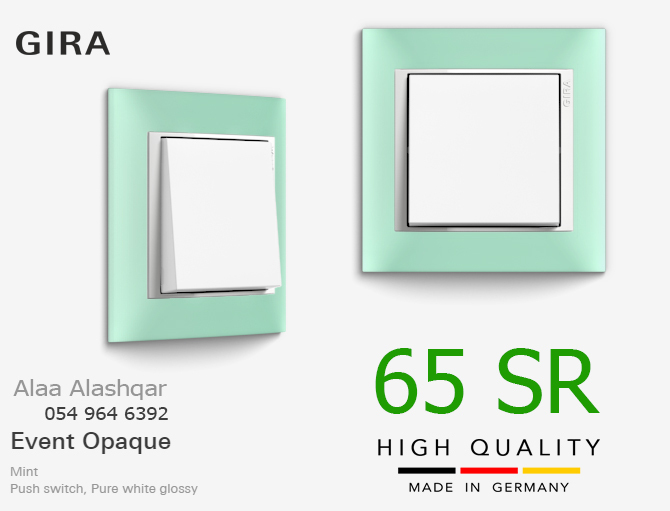 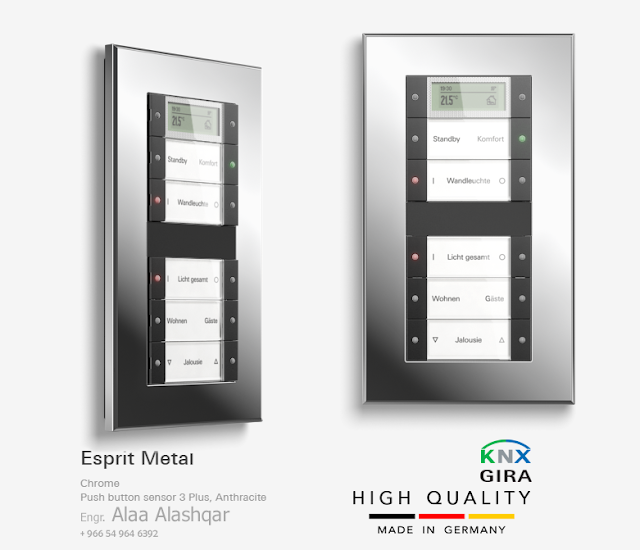 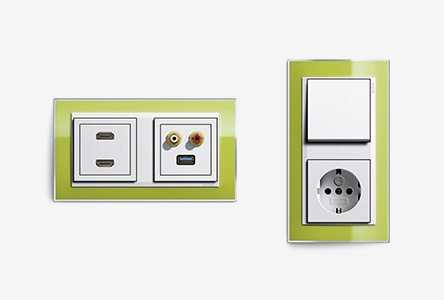 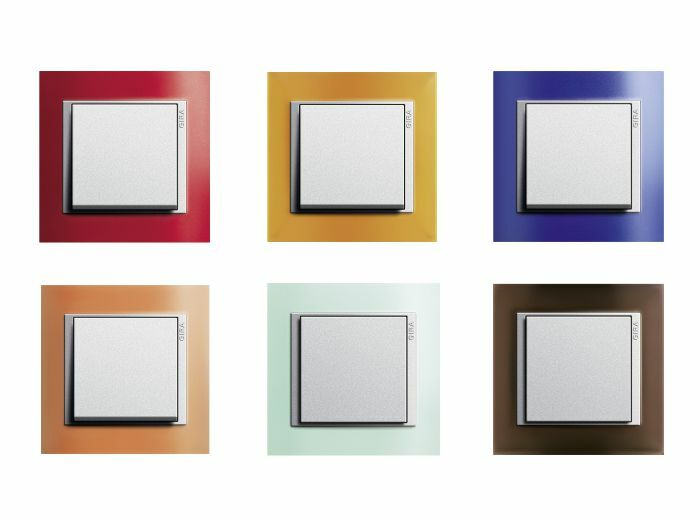 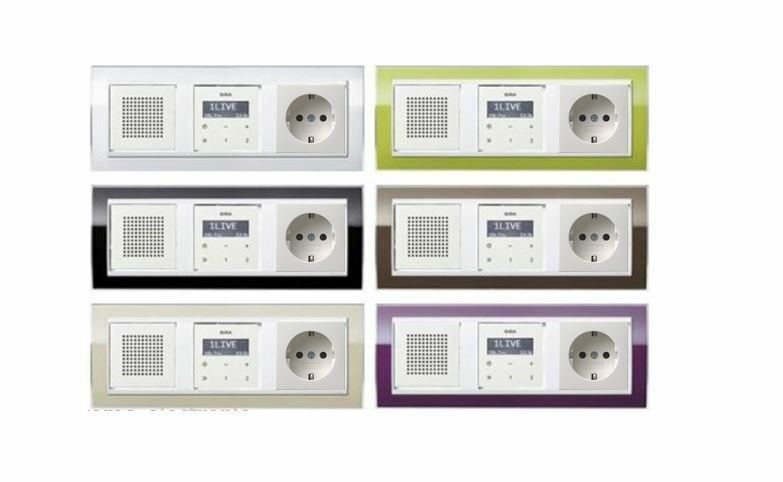 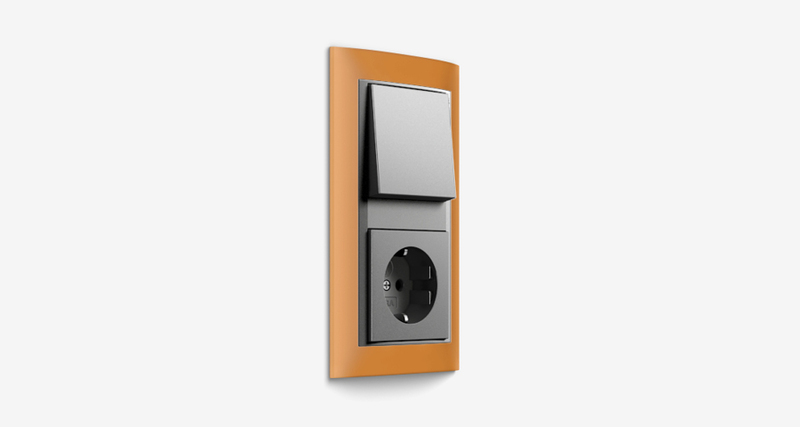 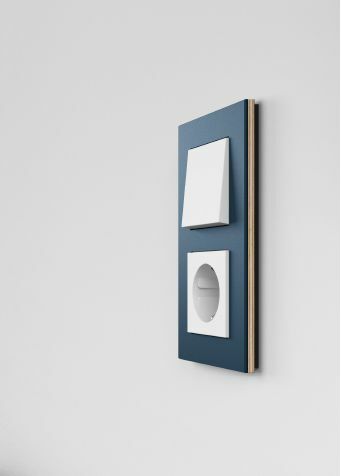 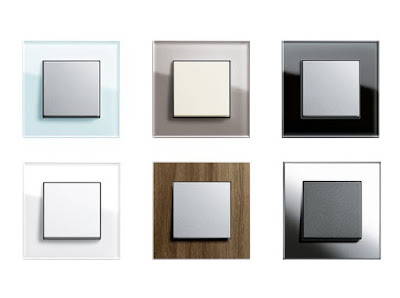 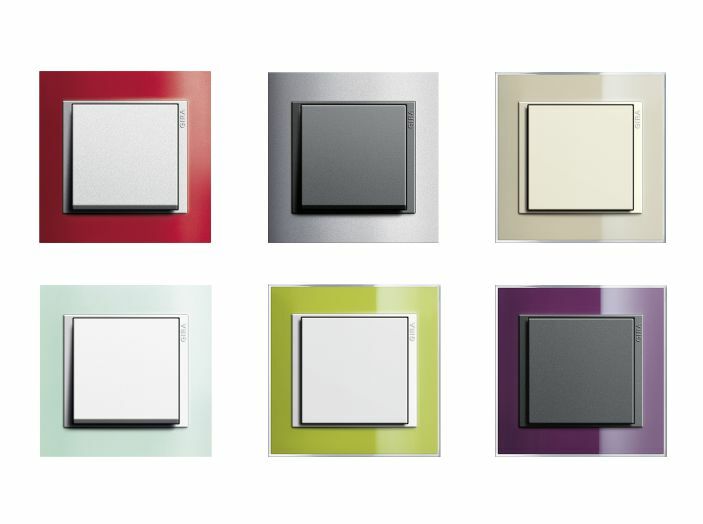 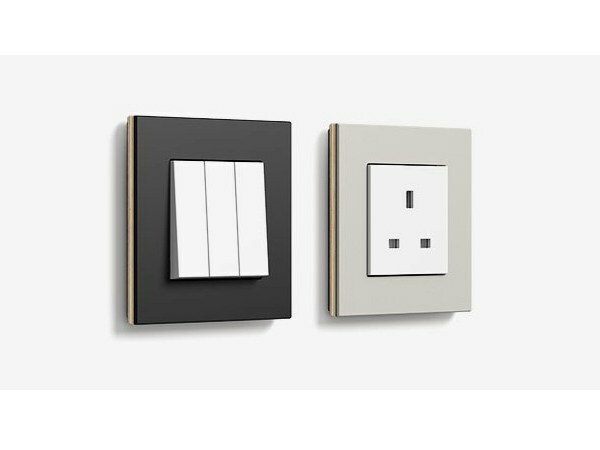 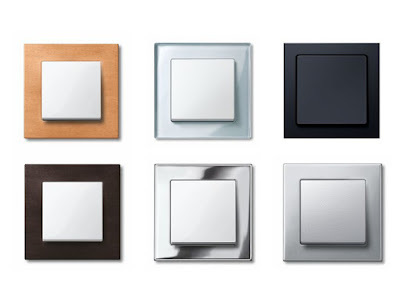 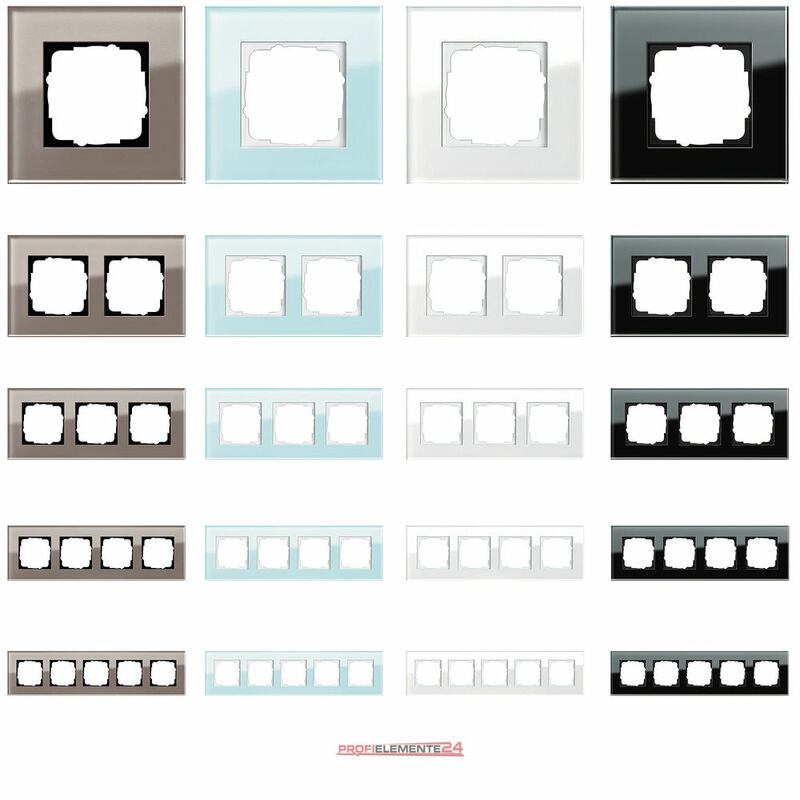 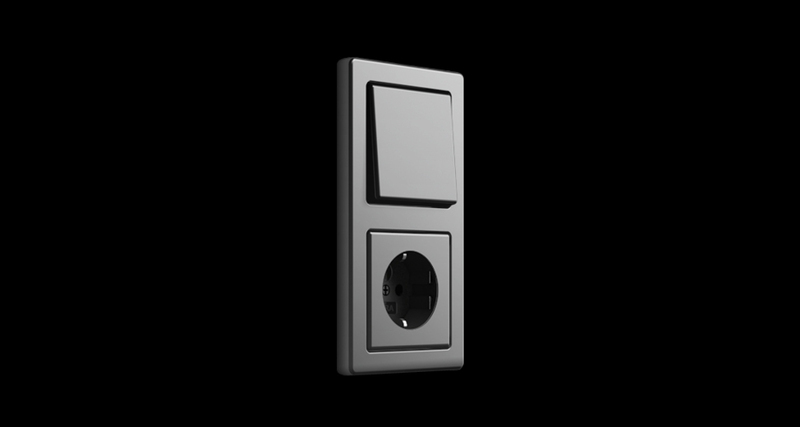 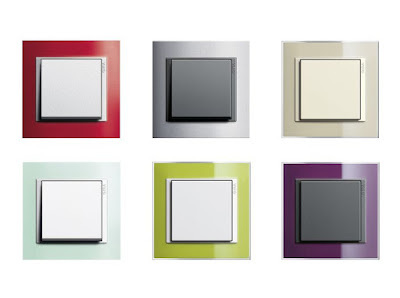 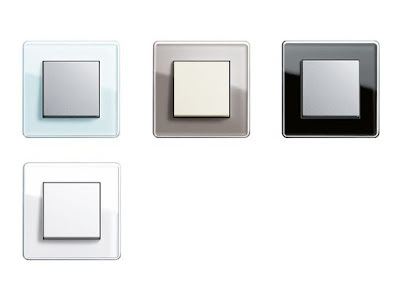 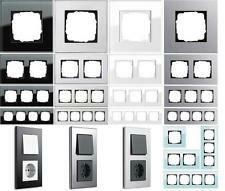 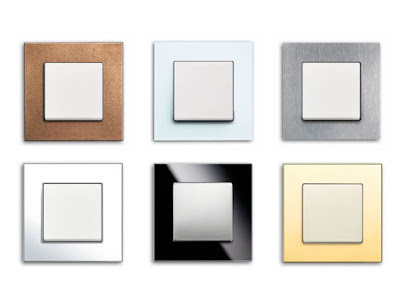 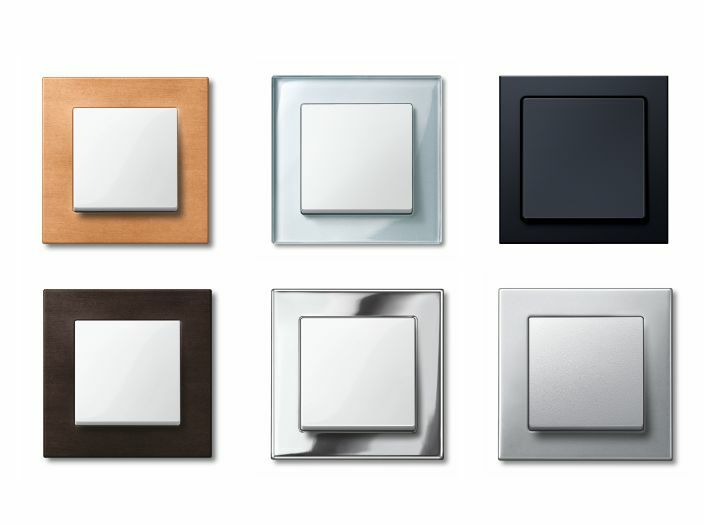 The Gira Esprit switch range offers an unusually wide diversity of materials. 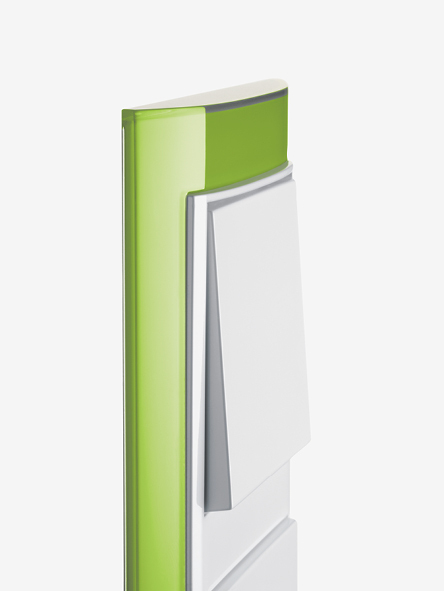 The clear frame design is combined with selected surface materials of linoleum-plywood, glass, or various metal variants. 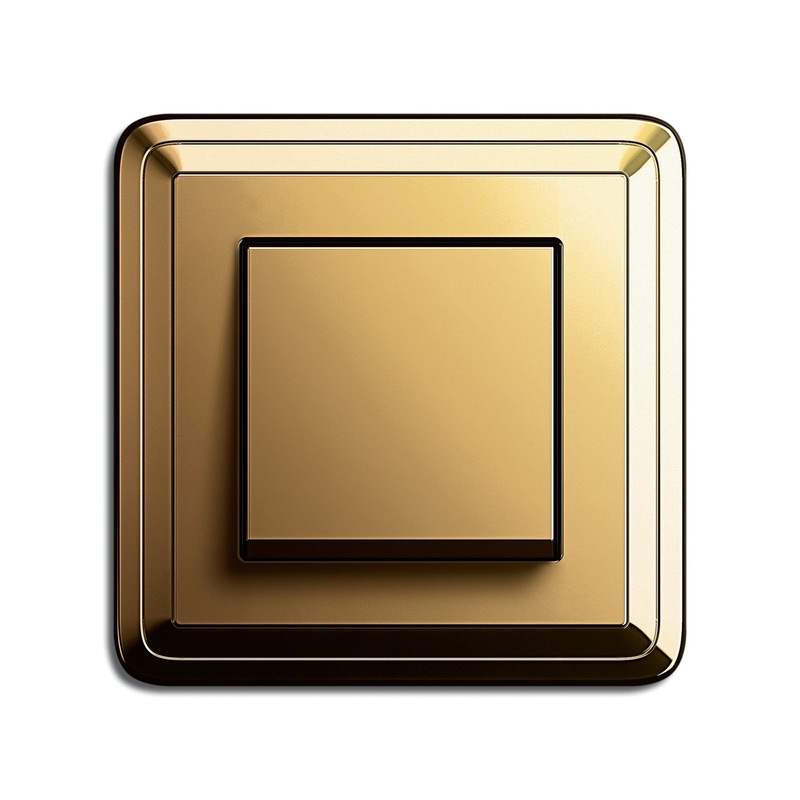 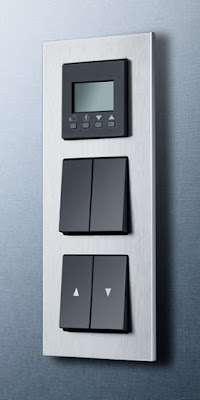 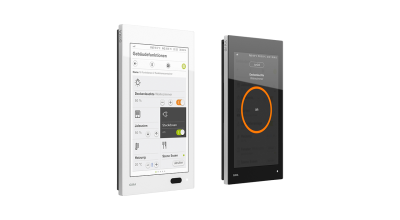 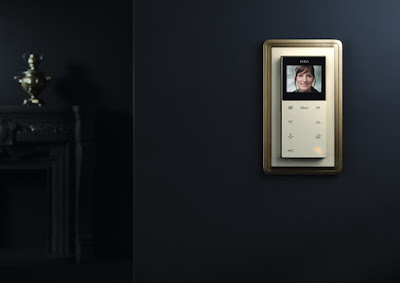 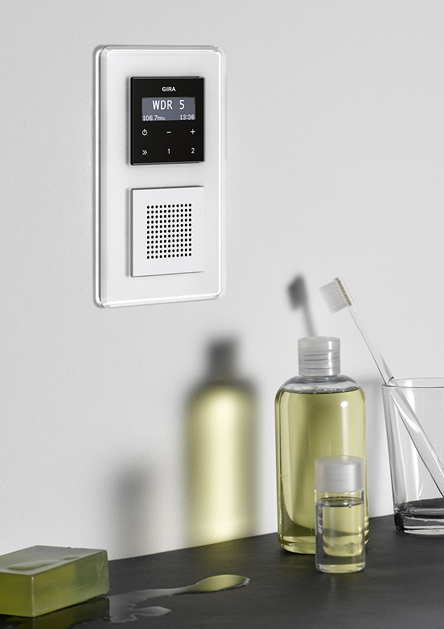 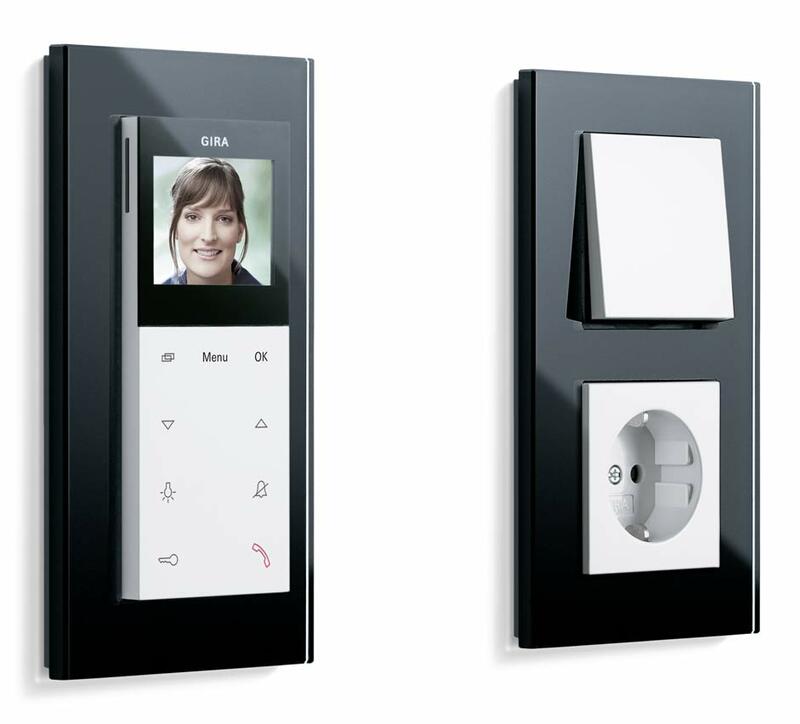 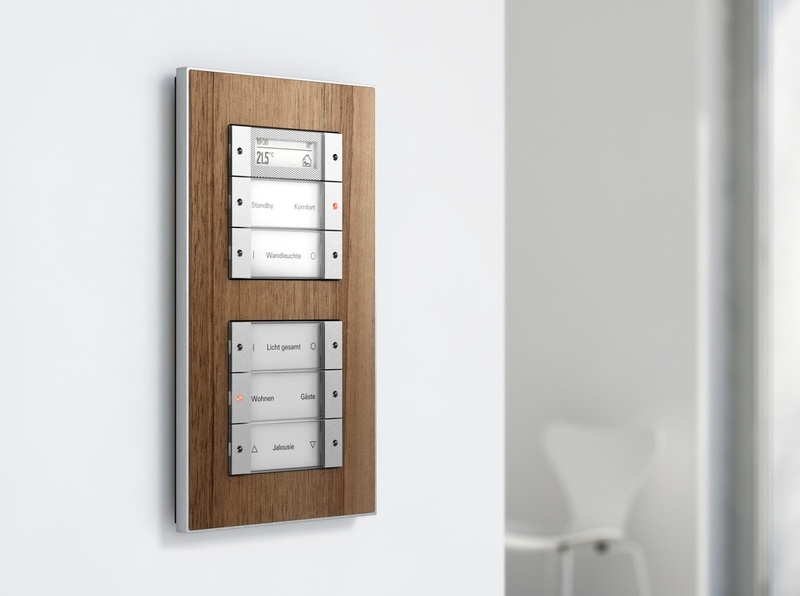 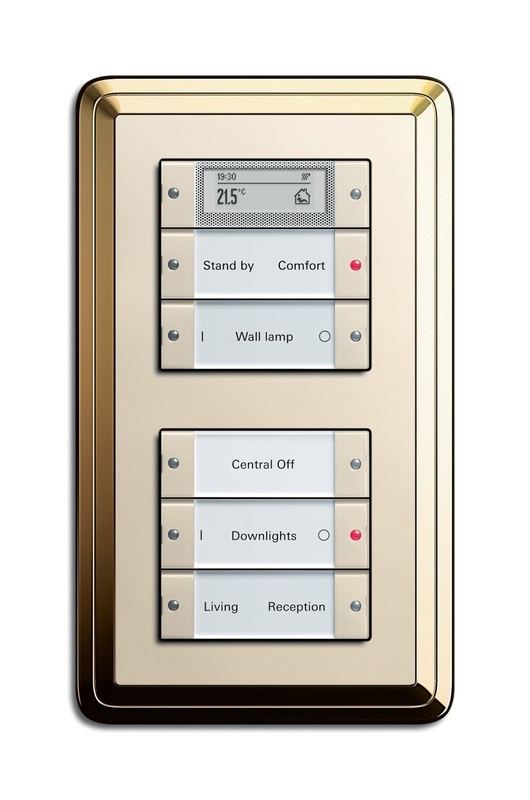 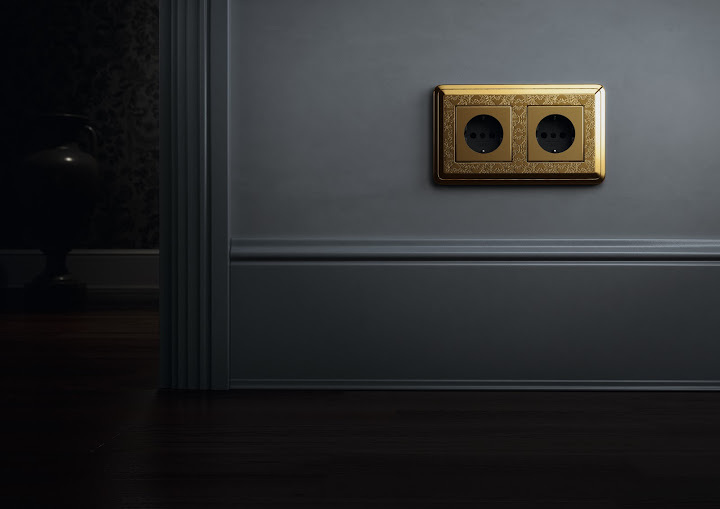 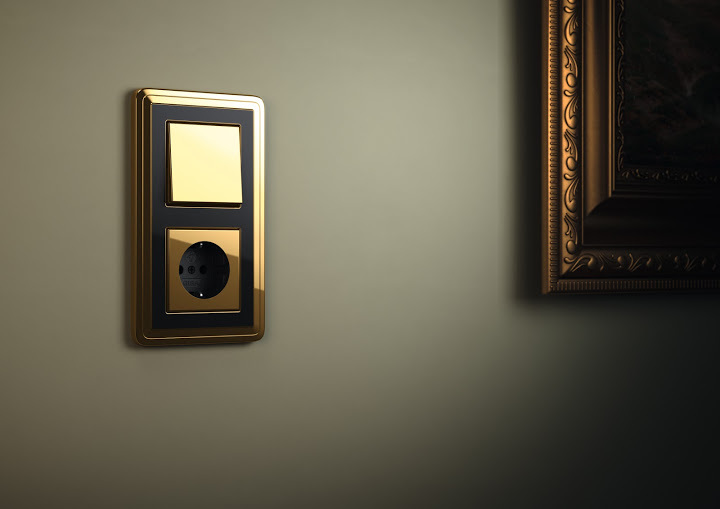 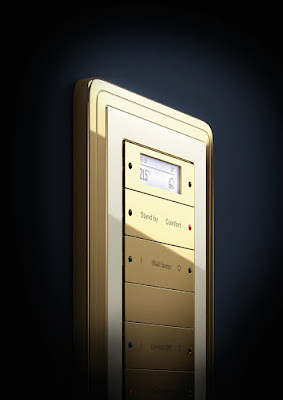 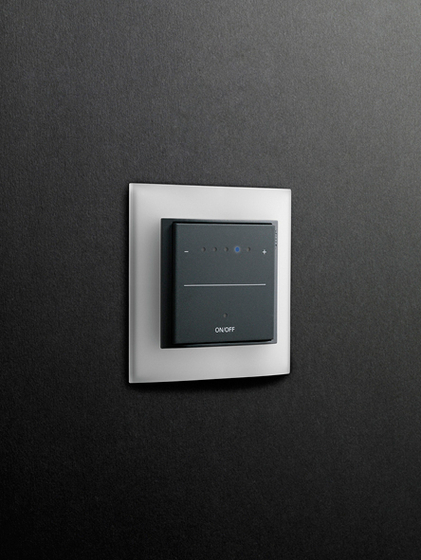 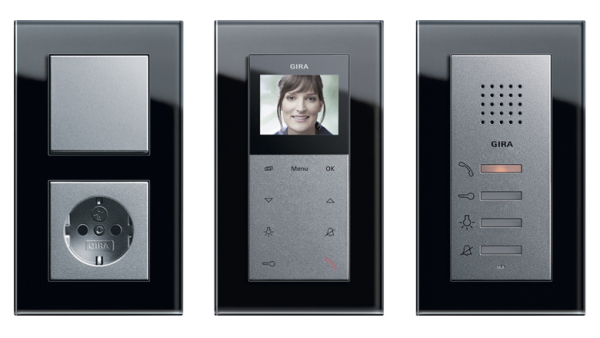 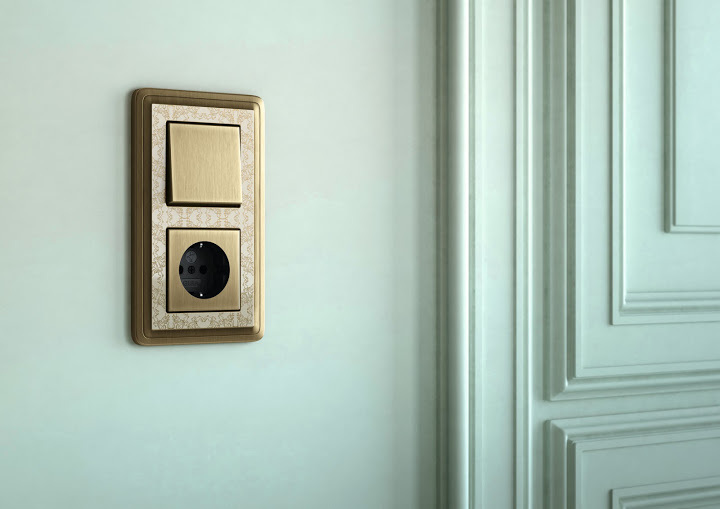 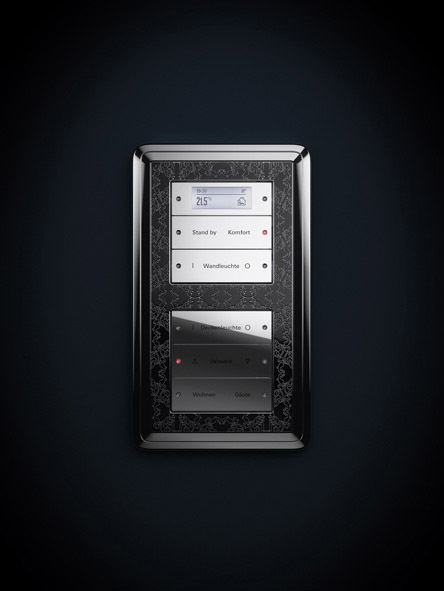 More than 300 functions that can be installed into the switch range offer maximum flexibility for all intelligent building technology requirements – from socket outlets and light switches right up to innovative systems for the automation and central control of the complete electrical installation. There is an appealing combination of the clear form of the Gira Esprit frames and glossy glass. 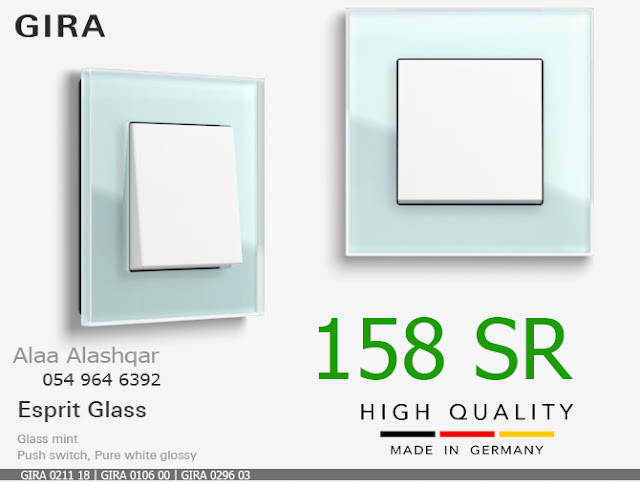 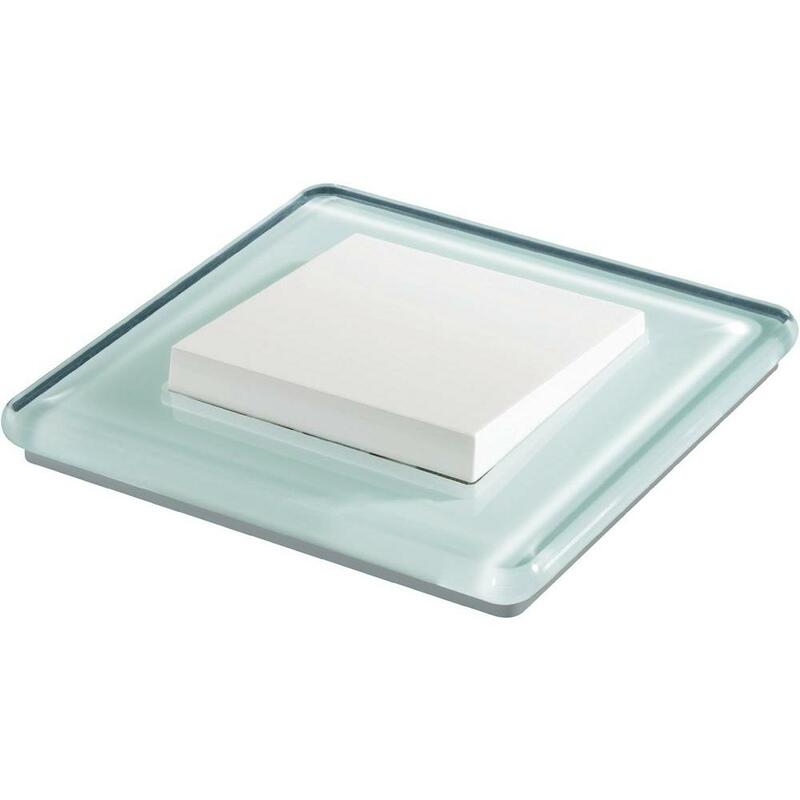 The frames of Gira Esprit glass are colour-highlighted in black, white, mint, or umber. This gives them a very sophisticated appearance on both light and dark backgrounds. 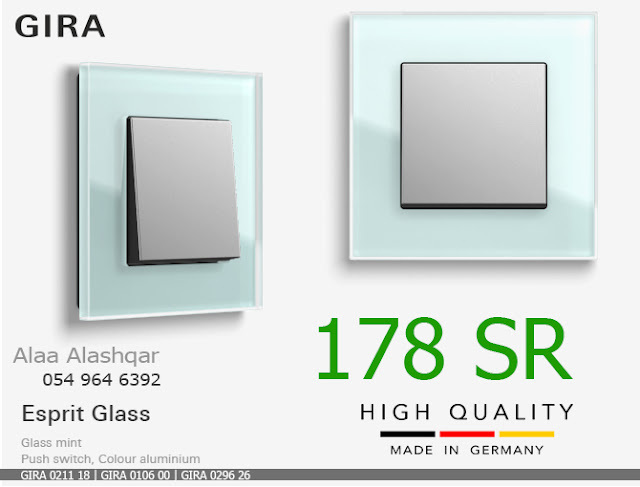 The high-quality frames are distinguished by their meticulous material selection and precise workmanship. 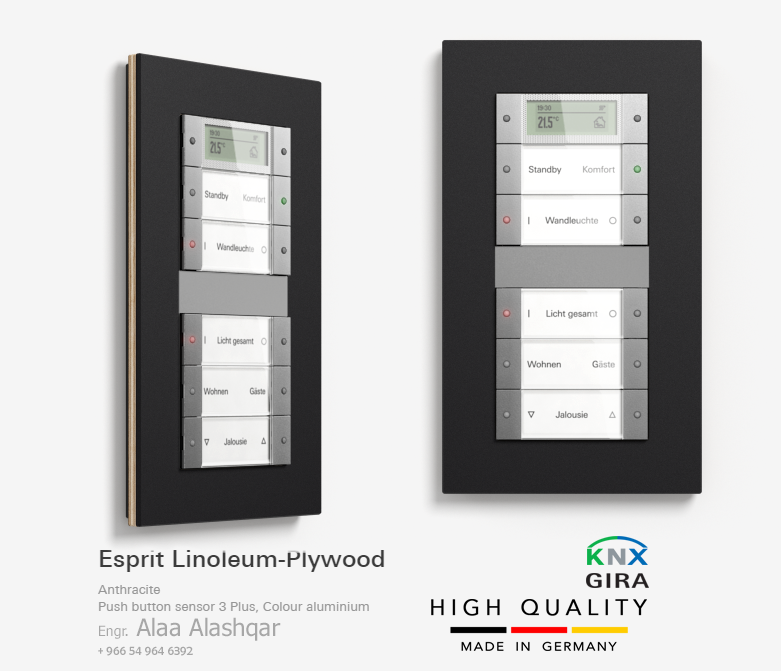 A special, sophisticated manufacturing process has been developed specifically for the Gira Esprit Linoleum-Plywood. In this way, extremely rugged frames which simultaneously appear very delicate are made in Germany as the result of the many steps which are subject to continuous quality control. A modern interior decoration classic: Birch plywood is preferably used in living and office areas which emphasise linear aesthetics and naturalness. 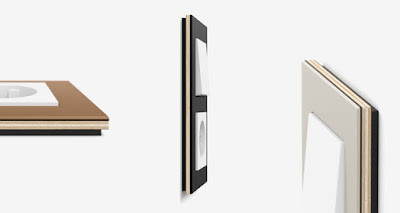 Shelves, tables, and chairs – including a number of design classics – have been made of this material. Gira Esprit Linoleum-Plywood is the first switch range to use this material. For the frames, birch plywood is used which is approximately 3.4 mm thick, five-layered cross-bonded, and therefore particularly strong. The layered structure of the outer edges provides an attractive contrast to the lustrous matt, coloured linoleum surfaces. The birch for the frames originates from sustainably managed forests in Finland and is PEFC-certified. The long, hard Nordic winter only allows trees a short period of growth each year, resulting in very thin and uniform annual rings. 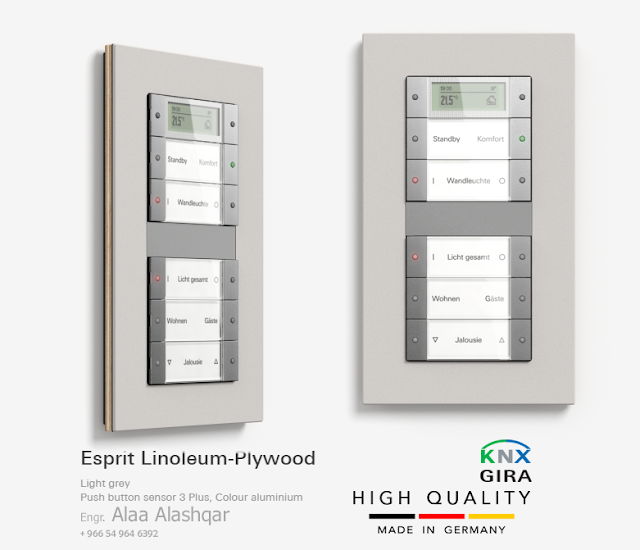 This makes the wood especially homogeneous and strong, which ultimately allows birch plywood to be produced that is delicate and yet rugged enough to be used for a frame with a total thickness of just 9.9 mm (including carrier frame). 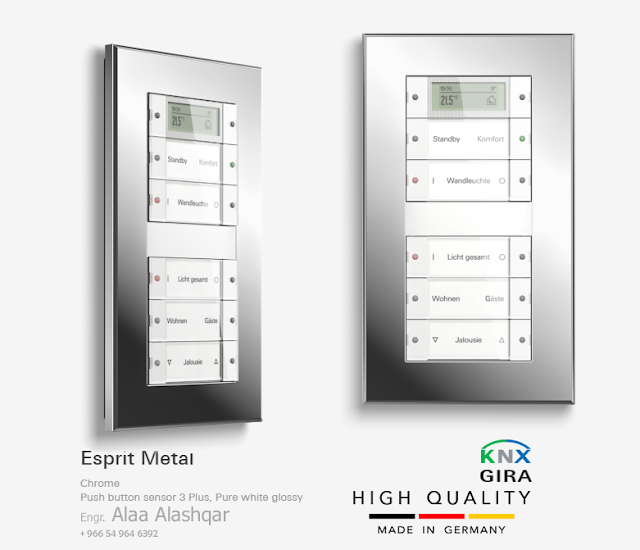 The clear form of Gira Esprit is particularly accentuated in its three metal variants. 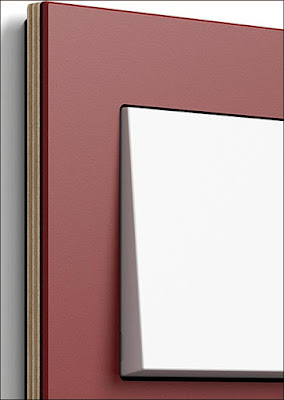 The aluminium frames are timelessly elegant: Their matt ground and anodised surface is distinguished by its discreet shimmer, which underlines their high-quality appearance. The aluminium, black, and brown colour variants are perfect for functional interior design . 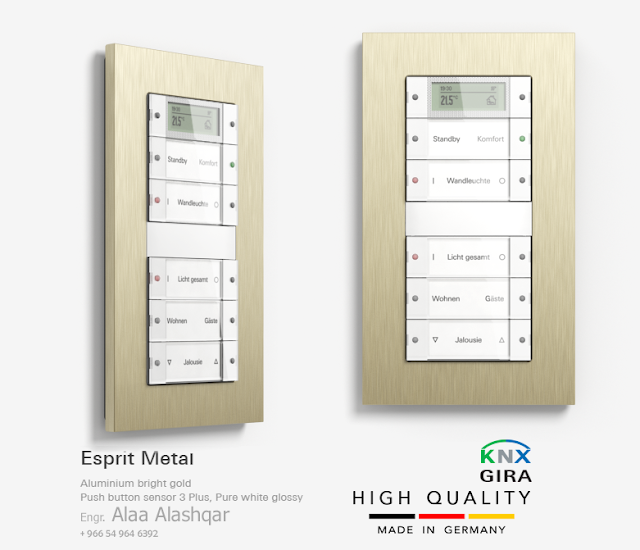 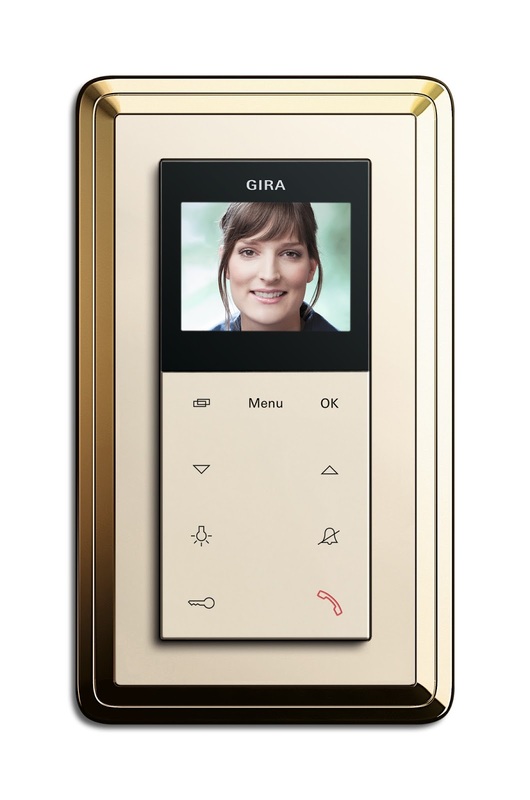 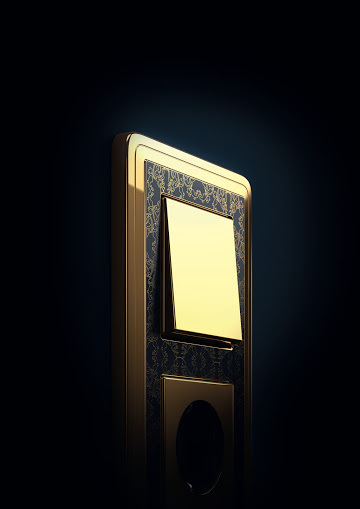 With its shimmering bright gold colour, the new Gira Esprit aluminium bright gold frame variant harmonises ideally with classic-luxurious living ambiances. 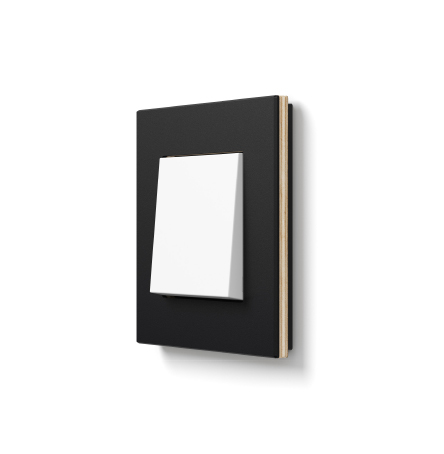 However, it is also an appealing eye-catcher when installed simply on a white wall. The subtle visible grained structure of the aluminium frame underlines the high-quality appearance. 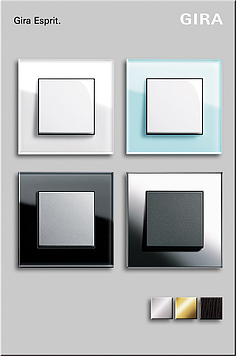 Modern colour concepts expertly set accents using dark colours. 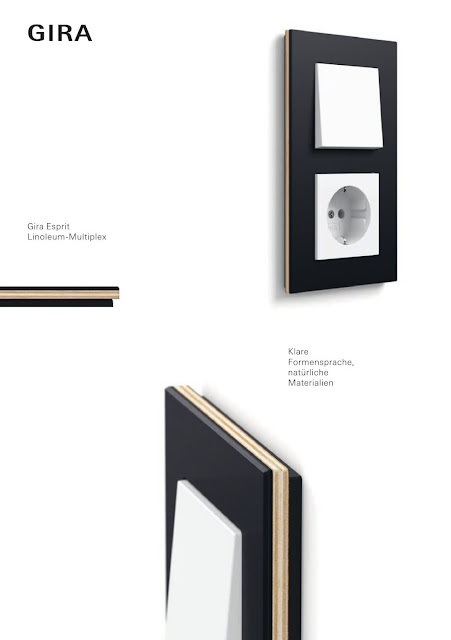 The frame made of polished, anodised aluminium in black is perfectly integrated in these concepts. 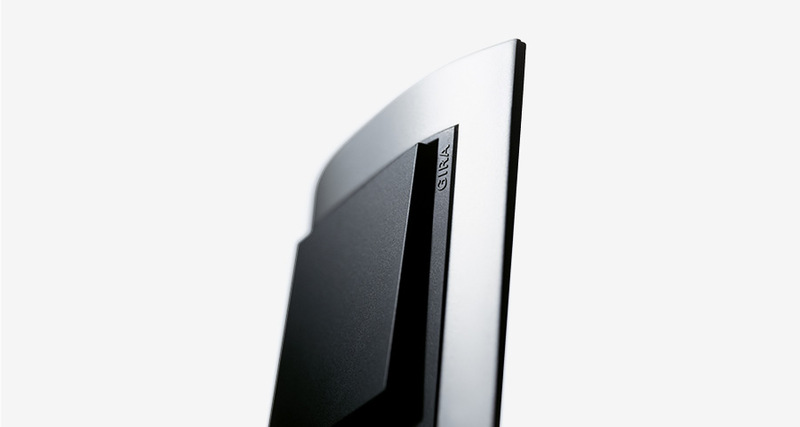 Anodising protects and changes the colour of the aluminium with an artificial oxide layer. 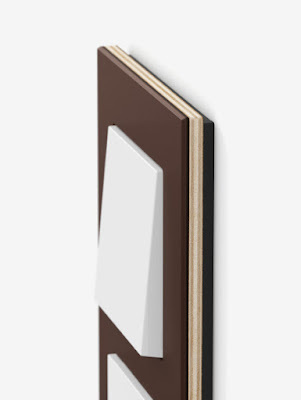 The natural grained structure of the material is maintained. The feel of the surface does justice to its high-quality appearance. 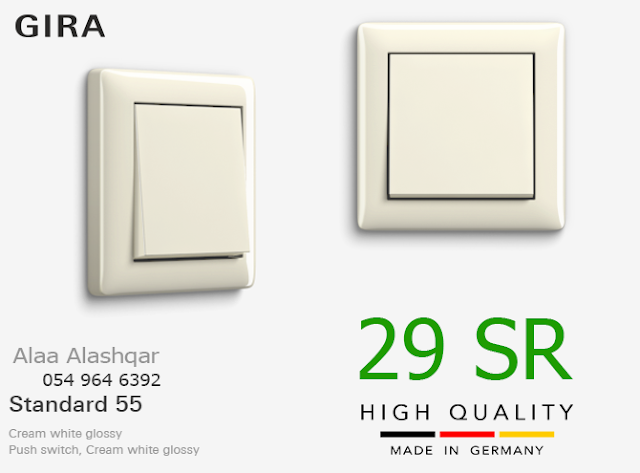 For example, when combined with white inserts, the result is an attractive interplay of a modern forefront and a classic background. The most influential architects of the modern and contemporary movements used the high-gloss appearance of chrome for finishing. Much of the furniture designed at that time have now become timeless modern classics. Sofas, armchairs and chairs with high-gloss chromed frames are still the current trend. The Gira Esprit chrome frame offers the matching expansion on the wall. With its high-gloss surface, its cool and unobtrusive appearance can be integrated in interior design. 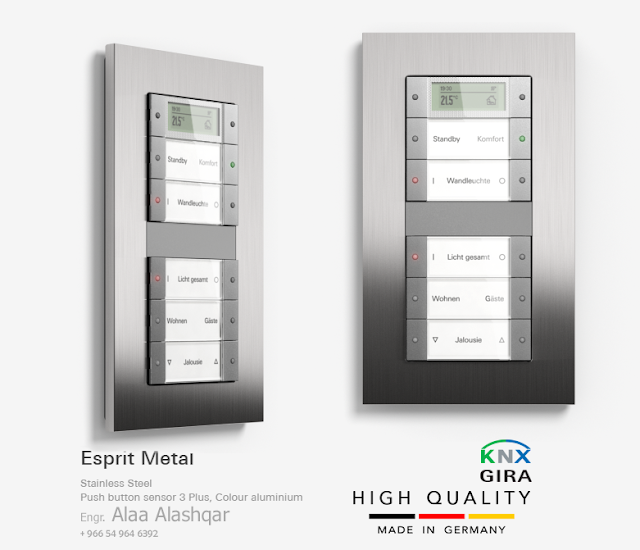 For the first time, the classic material of modern construction is being used as part of the Gira Esprit range: stainless steel. The quality of the material used particularly comes into its own in the brushed variant. Developed slightly more than 100 years ago, stainless steel has since established itself in many areas. Its functional properties have contributed to its widespread use just as much as its clear metallic aesthetics. It is used to clad the façades of avant garde buildings, in high-quality kitchens and for household appliances, as well as for sophisticated switches. 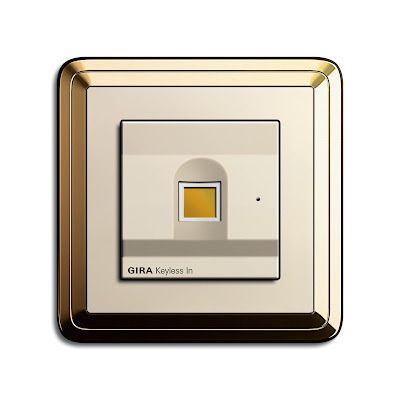 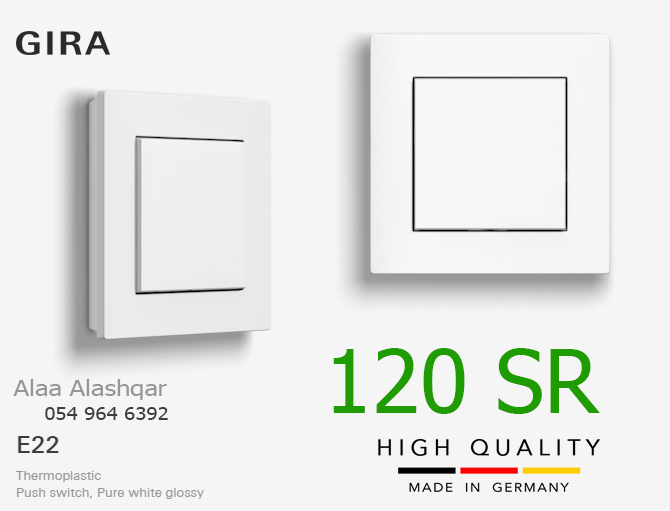 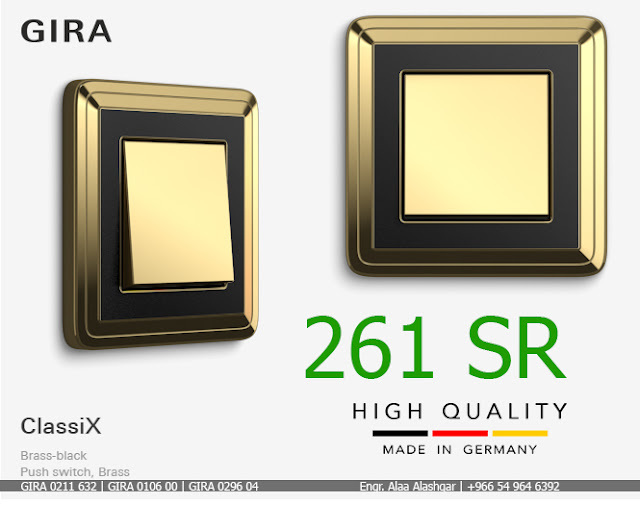 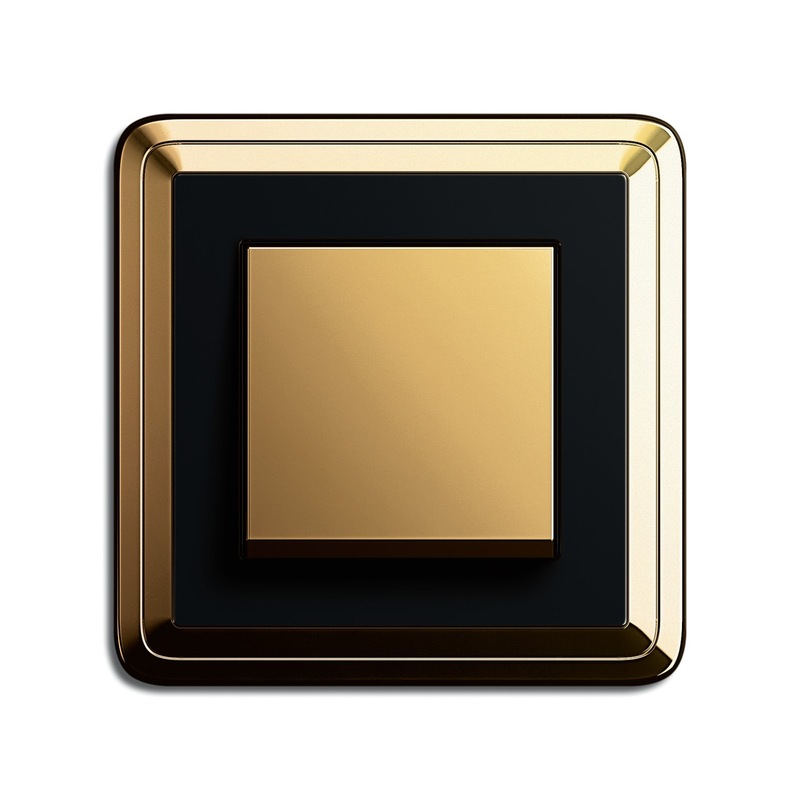 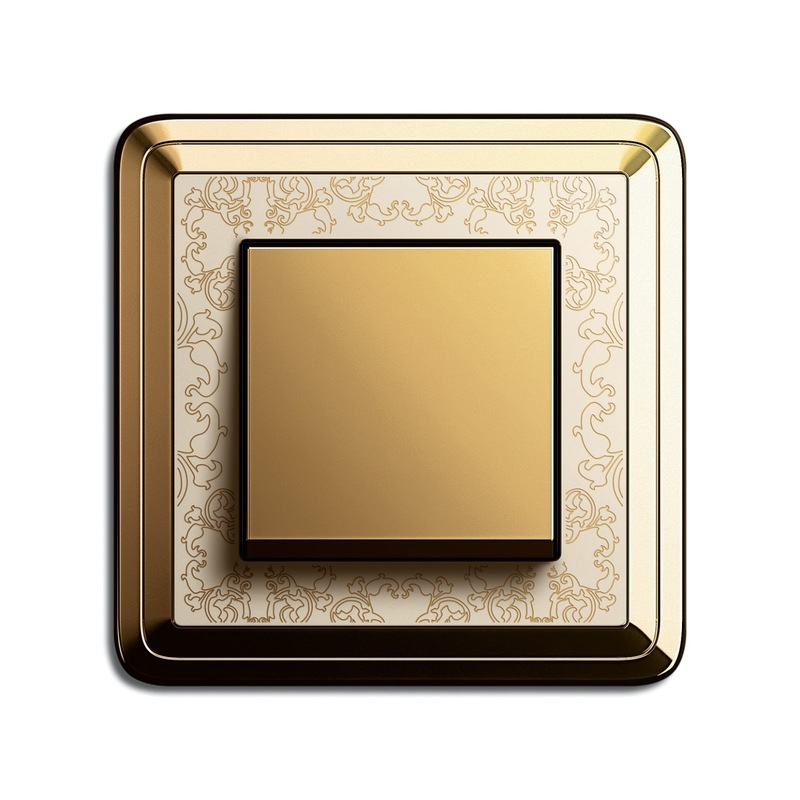 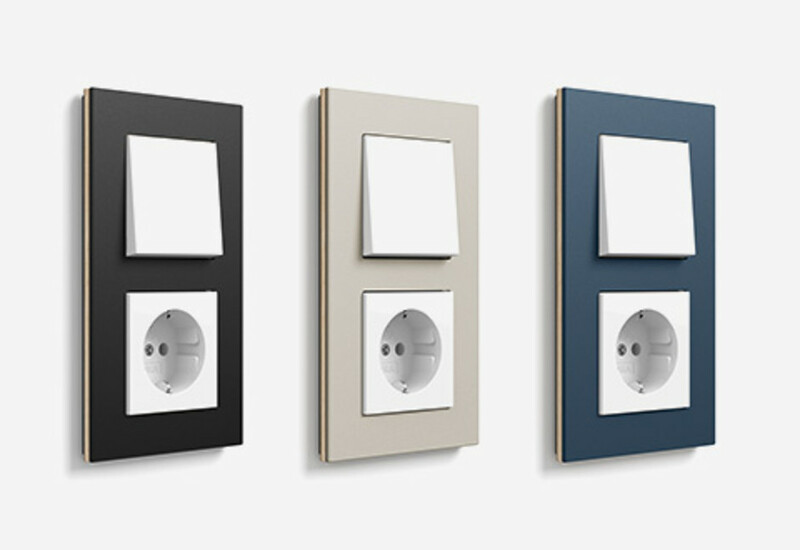 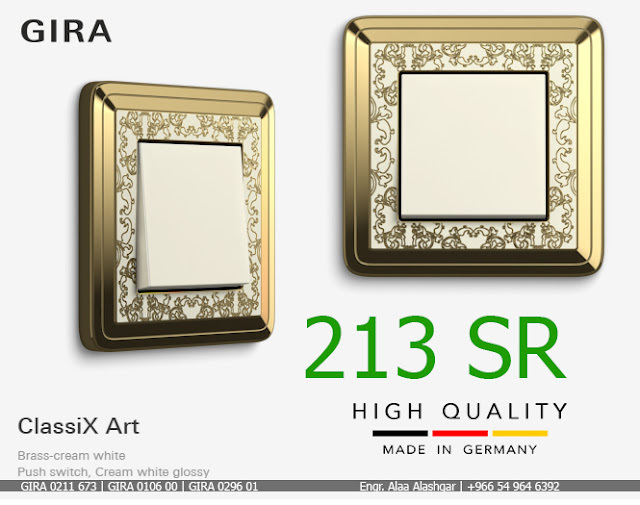 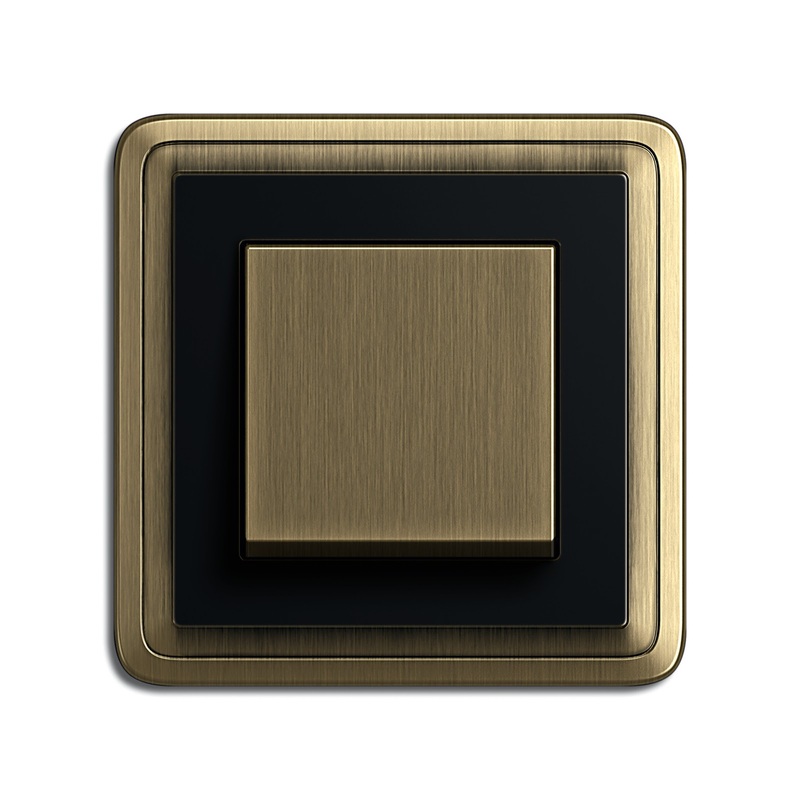 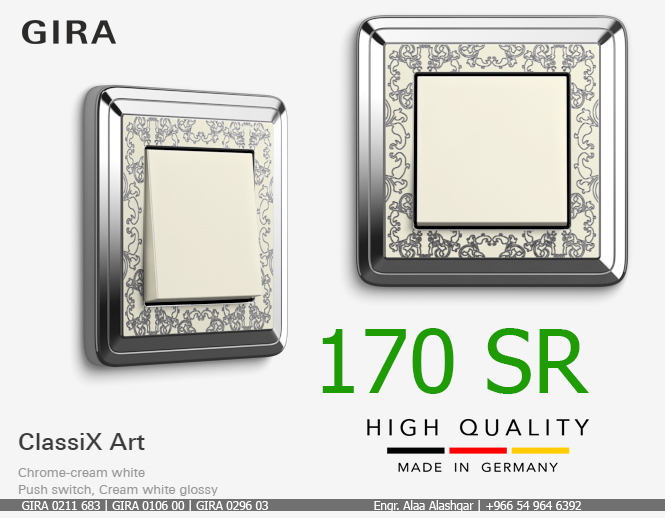 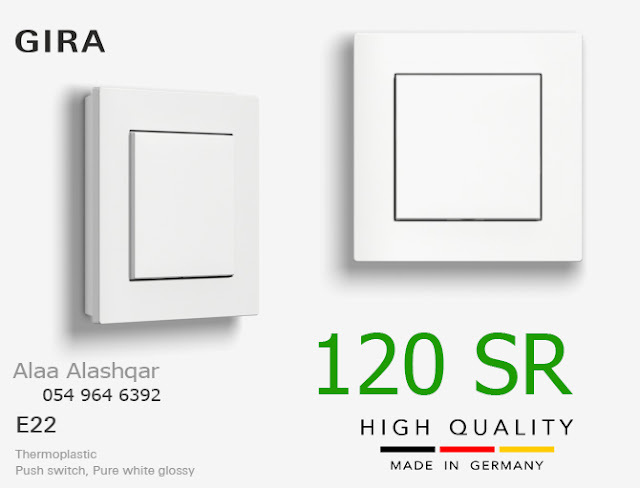 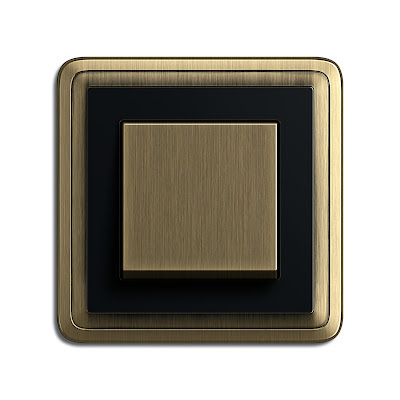 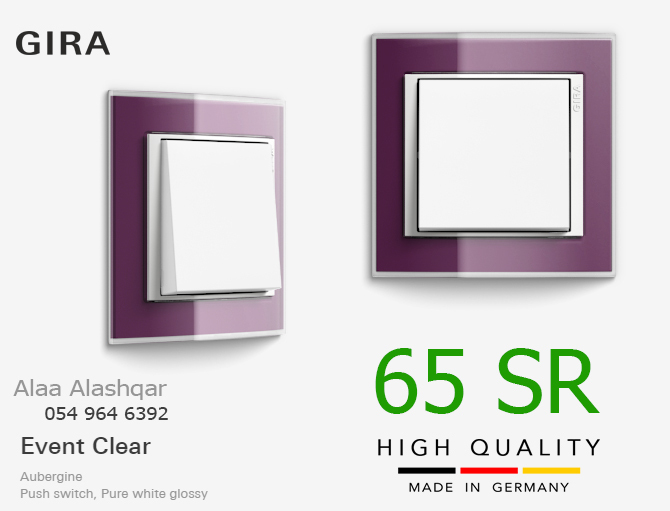 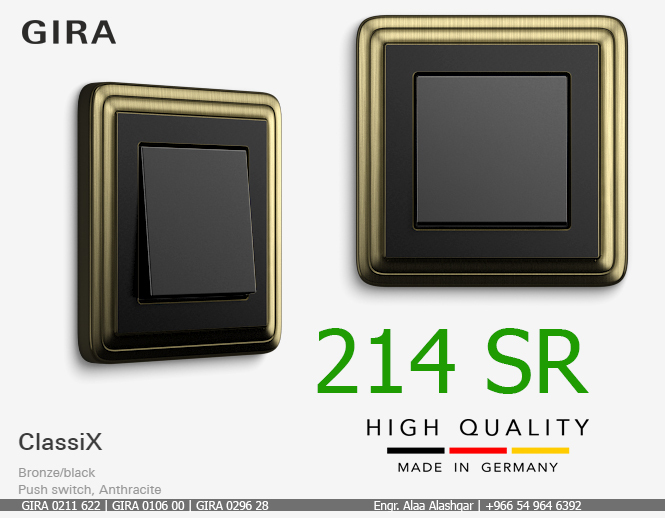 With its perfected surfaces and harmonious rounded corners, the Gira ClassiX switch range sets new standards for stylish and classic interiors in an exclusive design. 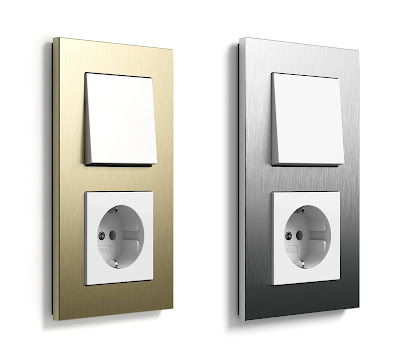 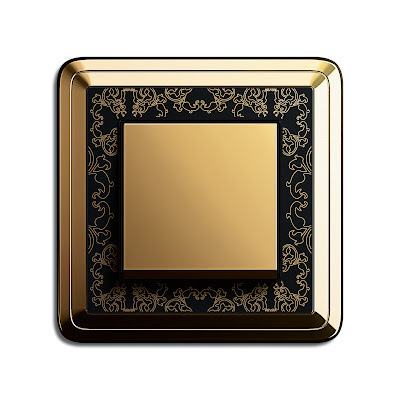 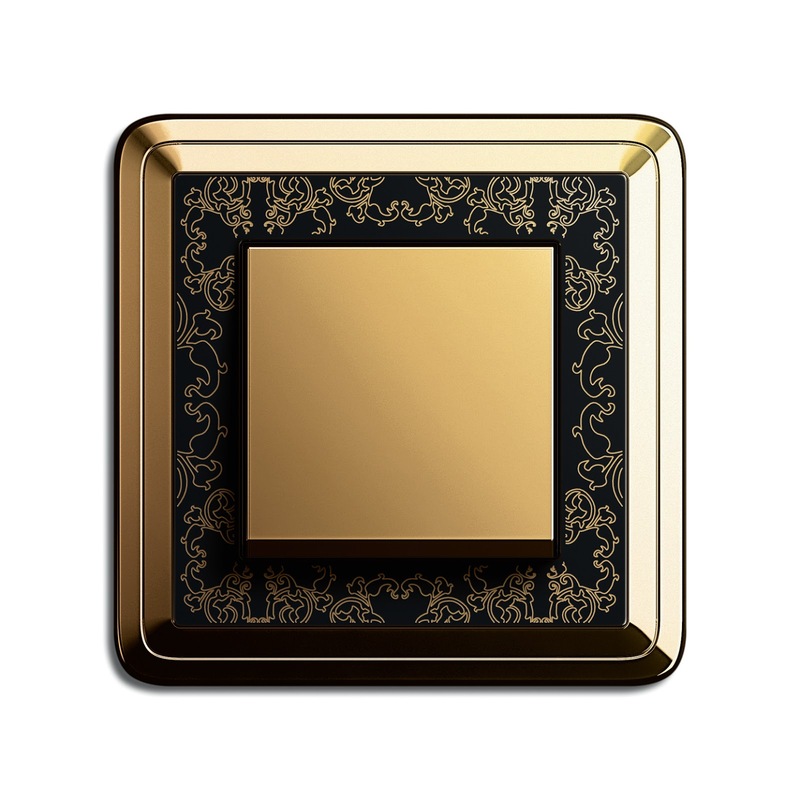 Cover frame variants in glossy gold brass, brushed bronze or glossy silver chrome are available to match the ambiance, both completely in metal and in combination with black or cream white inserts In the ClassiX Art design line, the elegant frames are also finished with artistic detailing. The delicate lasered-in details set attractive accents. 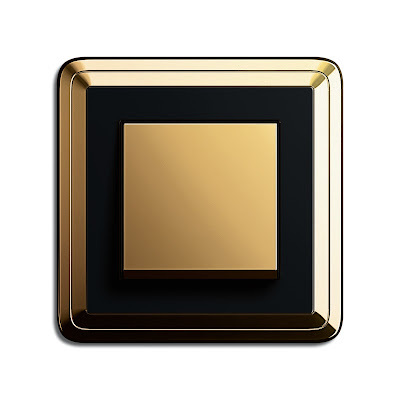 The glossy gold surfaces of the brass variants create an atmosphere of elegance and luxury, which means they are ideal for use in stylish, classic interior decoration. 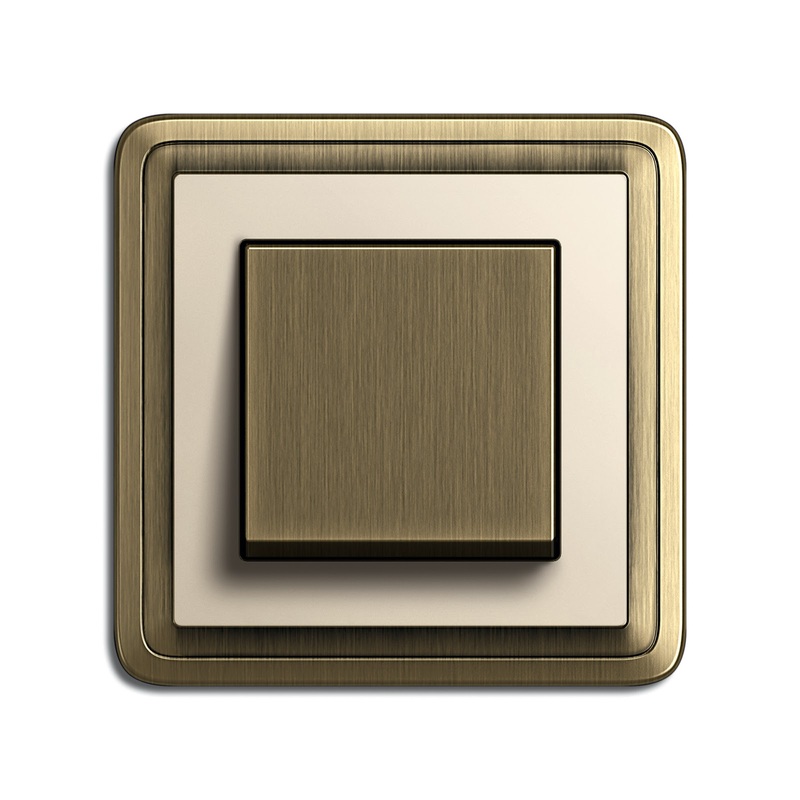 The warm colour tone and the silky feel of the surface give the bronze variants an elegant, high-quality character. 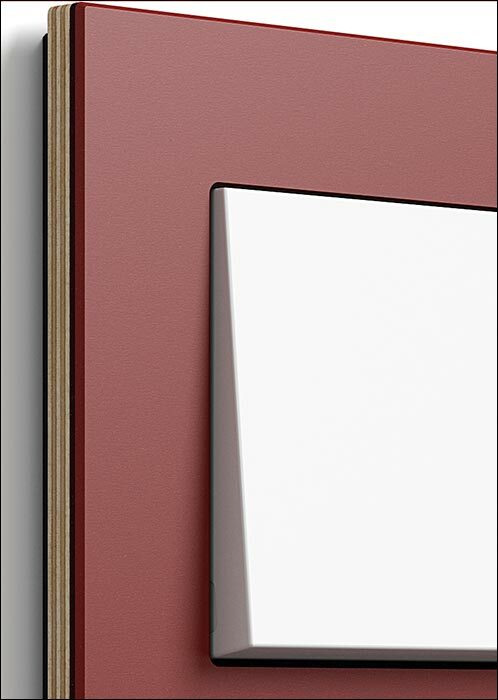 The cover frames are perfected carefully by hand, which provides them with a visible grained structure that makes each one unique. The glossy silver chrome variants are fascinating due to their cool appearance and fine light reflexes. Thus they feature brilliant and yet discreet aesthetics which are especially underlined in classic-modern room concepts. 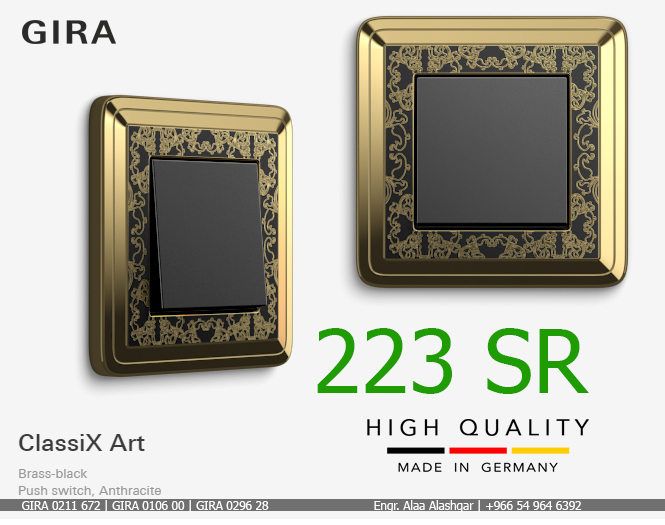 من أرقى الافياش والمفاتيح في العالم .. شاهد الفيديو..
امكانية توريد وتصميم المنازل الذكية ,, تابع الفيديو ..
أفياش ومفاتيح ادسون , أفياش ومفاتيح سانيو . 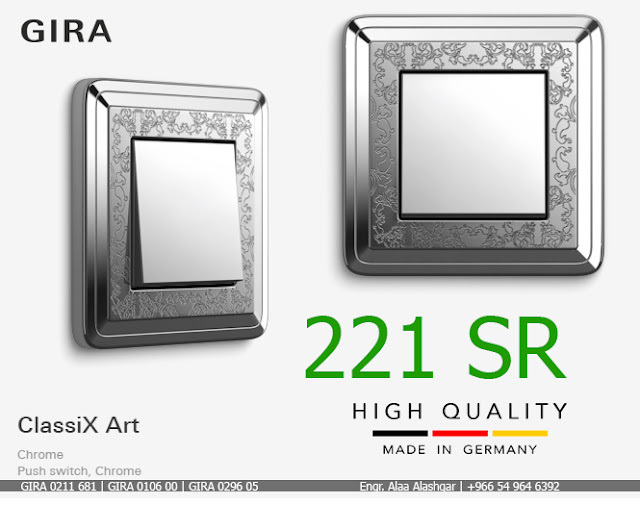 فيديو اخر عن الانظمة الذكية .. وامكانية التحكم بالانارة والستائر والتكييف والتلفاز وانظمة الامان والعديد ..
للقصور الملكية والفلل الفاخرة - جودة عالية .